After ten days of solid monsoon rains in Western India it is forecast not to stop for another two. The vegetation was lush and bright green in contrast to the grey skies thick with heavy cloud hanging just above the buildings. It was humid but not hot, in fact a pleasant temperature but without an umbrella we’d have been soaked to the skin in seconds. The driver who took us from Mumbai airport to the hotel when we arrived mid morning told us that he expected the nine kilometre journey to take us about an hour because of the traffic but, due to the rains and serious flooding many people appeared to have stayed at home so the streets were relatively quiet (only to the experienced eye, it seems) and we made the journey in about half an hour instead. We drove past stallholders on little islands in the water; past auto-rickshaws pushing in front of brightly painted Tata trucks and black and yellow Fiat taxis to dodge the deepest floods; buffalo carts ploughing through deep water regardless; men with no shoes walking along rough paths; women in beautiful saris sheltering under umbrellas but ankle deep in muddy water; children splashing and water flowing through shanty streets threatening a serious disaster. After some time spent contacting people and trying to make arrangements for our time in Mumbai we rushed out during an interlude in the rain to eat our first Indian meal since leaving London – a really tasty, good value and filling veg thali. We were even given a share a chocolate cake from a party celebrating at another table. We agree that we’re going to enjoy our time in India. Even the title of today’s “The Times of India” is printed as if reflected in a mass of water! Apparently, the monsoon is due to recede for a couple of days from tomorrow then return with heavy rain for the rest of the month. There is now a depression over India with several low-pressure areas moving westwards one after another and becoming very dense in places. A report from the Regional Meteorological Centre said that there are usually two to three low-pressure areas per month in the monsoon season but in the last ten days there have been three such areas hence unusually heavy and frequent rain. All long-distance trains out of Mumbai were cancelled yesterday leaving hundreds if not thousands of people stranded on the platforms; there are serious disruptions from flooding and landslides on the main roads into the city with some roads being closed and the Mumbai-Pune Expressway (the route we intend to take) reduced from eight to three lanes; even the Bollywood film industry, based in Mumbai, is taking a toll with the heavy downpours disrupting outdoor filming. What is, we are told, usually a fifteen-minute drive from where we’re staying took an hour as Rashid negotiated his car through the traffic along flooded potholed streets in yet another downpour. It was only “drizzling” during the previous hours interlude but it was high tide so the collected rainwater had not been able to drain away. Driving the short way through back streets was not an option because there it was even too deep for a 4X4 or a bus. The red public buses seemed to be the most robust – charging through deep water at junctions that most other vehicles were backing away from – it is reported that, despite all the disruptions, bus services have not been disrupted at all and, in fact, are standing by in case the local rail service is halted. Sounds as if the company name “BEST” is appropriate! By the time we returned to our hotel in the early evening after a relaxing afternoon at the home of Jan and Rashid and their adorable children, Joshua and Anousha(h) the floods had receded, the roads were clearer (therefore the shocking number of potholes visible), and the whole place was livelier. We had a consultation with a local homeopathic doctor this morning, not because we’re ill but because there is a low risk of malaria in Southern India and it has been suggested that we might like to use homeopathic medicine to build up our immunity prevent us developing malaria if one of us is unlucky enough to be bitten by a carrying female mossie. This afternoon we received the disappointing news that the container holding our car has been offloaded in a port in Dubai, not, as was originally scheduled, transhipped in Oman which would have meant that it would be on it’s way to Mumbai by now. Furthermore, it had not been booked onto another ship and, as today is Friday so not a workday in the Middle East nothing can be done until Sunday. 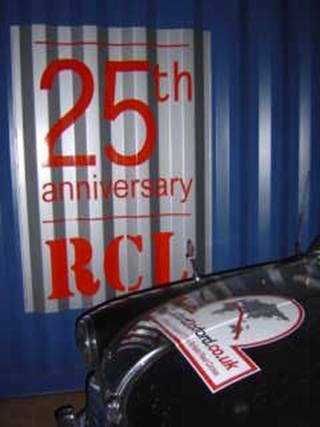 We are disappointed because it is now unlikely to arrive before the 14th or 15th August and will then take three days after unloading the container to get the car through customs. At least we have now met with the team at Safmarine/Maersk here in Mumbai who were very helpful and with the support of Koen Bronder, Chief Executive Officer, Safmarine Linear India, we feel sure we will make good progress. Joanne got her hair cut today, the first time since 10th April, and emerged from the salon looking much neater. Tim is resisting the smart salon cut and is looking for a good street hairdresser to trim his locks and beard. After a meeting to discuss joint publicity, the Taj Mahal Hotel invited us stay for a buffet lunch that we very much enjoyed. Just before we left the hotel we received a package with SIM cards inside so, thanks to Airtel, we now have mobile phone communications in India. We spent the rest of the day with our host for this weekend, Koen Bronder, CEO Safmarine Linear India, and his son, Nathan, who took us to “Leopold’s” for a fresh fruit juice, a busy café that boasts that it has been serving since 1871, then to the Mahalaxmi Temple. Down a small road perched overlooking the sea the temple was teaming with people offering bowls of sweets and flowers to the god of wealth. Koen and his wife Stella had kindly invited us to stay with them for the weekend at their apartment near Malabar Hill whose main rooms have fabulous views over the bay and we were very happy to accept their hospitality. 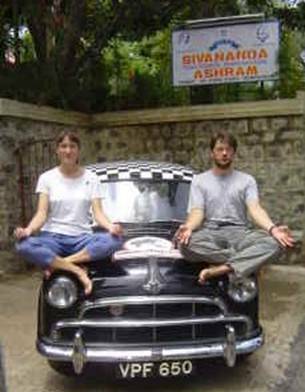 We had discussed spending some time while in India on a yoga ashram but have agreed that it might be best to do this on the return journey instead of the outward journey. Both of us have practised yoga for several years but neither would profess to be particularly proficient. Since we left Oxford, UK, at the beginning of May we have swum and walked whenever we have had an opportunity but must confess that we have not practised much yoga so we were pleased to be given the opportunity to join Koen’s practise with a tutor this morning. A really good way to start the day but it made us both realise how stiff and out of practise we are! Not far from the apartment is the Malabar Hill and it was on the edge of this hill that, according to legend, Rama fired an arrow (ban) into the ground causing water to spout forth from the holy Ganges (Ganga). The tank that is still filled by the spring waters is considered holy and, according to a seventy-year-old man, sitting on the steps of the tank with his wife and ten year old son, now is the most popular time to visit the sacred waters of the Banganga Tank. We walked down then wandered along the steps at the edge of the water watching groups of women in bright saris praying around small offerings; families and children playing and pouring water over each other; groups having picnics; and boys swimming. 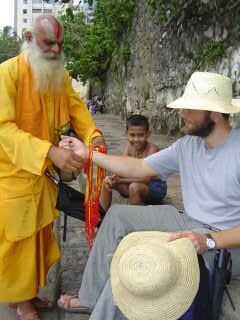 Tim listened to the priest’s prayers, as he tied an orange and red cotton band around his wrist. Yesterday evening we went out for dinner with our hosts, Koen, Stella and their son Nathan, and Mr Farokh Mistry and his family. 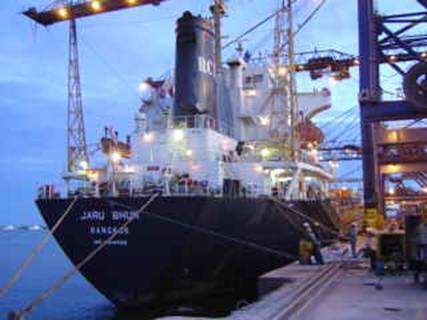 Farokh,as the Executive Director of Prudential Shipping Agencies Pvt. Ltd here in Mumbai, is a customer of Sarmarine India Pvt Ltd.
We need an agent to handle all of the formalities involved in getting our car out of the container, once the container is in the right area of the port,and through customs and Farokh kindly offered to help us with this. When we called at his office this afternoon he had already arranged for Vispee Patel, who handles the import of all British High Commission cars for Mumbai and Delhi, to join us so we could begin to complete the necessary paperwork. As Koen had suggested, it is a good job that we have begun this process in advance of the arrival of the car because there is so much involved. In fact, so much more than if we had air freighted the car or driven across a land border. We have a Carnet de Passage issued against a bond, 5 x the value of the car, by the Royal Automobile Club (RAC). This should be recognised internationally as a guarantee that we will export the car after temporarily importing it and therefore we should not have to pay duties. Until now we have only needed this document in Libya and Egypt, where it was accepted. Unfortunately at port customs in India this document is not accepted as genuine without a letter from the India Automobile Association issued once they have received a fax from the RAC in the UK stating that they issued the Carnet de Passage. Still, there is no way around this formality, nor the many others, it seems. We tried to forget that it was Friday 13th as we were driven two and a half hours to Nhava Sheva, the new port of Mumbai located on the main land. After a full day spent waiting and going from office to office to get the appropriate person to sign the appropriate piece of paper then waiting again for the container to be moved from the port to the container freight handling station we accepted that there was no chance of getting the car before Monday. The Port, it seems, is so congested with containers that there is a huge backlog in moving containers in or out. Thanks to our friend at Safmarine talking to the MD of the transport company and a little cash being handed to the relevant person on the ground it seems our container may be moved tomorrow so that we can access it on Monday. By the sounds of it that is actually very good going. We were surprised that, other than coachloads of people gathering at the Gateway of India, the Independence Day Celebrations were quiet. 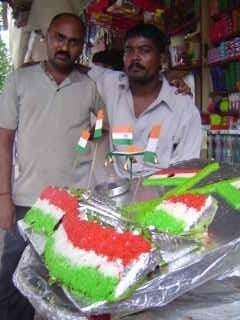 There were flags everywhere, though, and even street stalls had food laid out in green, white and orange. 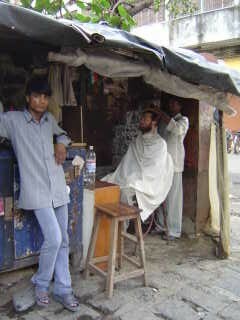 Tim succeeded in getting his hair and beard trimmed at a barber on a street corner. Phew! Tim finally recovered Florence from the grips of the Port Customs after a frustrating day there spent getting signatures on various bits of paper, waiting, more signatures… It would have been almost impossible to navigate the bureaucracy, much of which is left by the British and has since been developed into an art form by the Indians, without Vispee from Prudential Shipping, Mumbai. The introduction of computers seems to have compounded the problem, as pieces of paper still have to be completed as well as forms on computers. Without an expert clearing agent like Vispee we could not have begun to understand how to oil the appropriate wheels and the car would probably still be in the container. 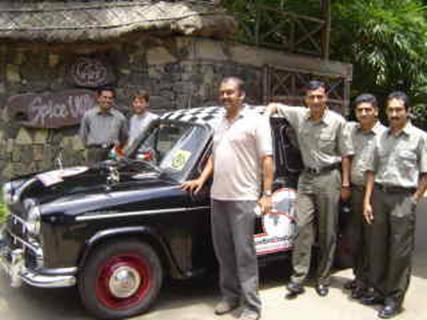 The Hindustan Ambassador is based on the series 3 Morris Oxford, ours is the series 2 and was produced in India as the Landmaster. 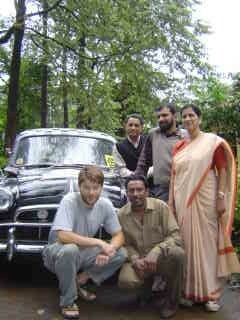 Hence the interest and the word plays on Ambassador, popularly known in India as the "Amby". We'll be doing more TV interviews over the next couple of days. It was dealing with the Communications Director of Hindustan Motors, one of our sponsors, that was not only challenging but surreal. Her shrieking and arrogant behaviour, witnessed by national TV cameras, despite my suggestion that it might not be appropriate, was quite unbelievable and resulted in the police threatening to impound our car and both Tim and I quivering with anger. I had never seen Tim so calmly furious! The officials would have probably arrested us too had we not driven off when tipped off by the photographer from “Autocar India”. Known to her staff as “Soni Ma’am” due, not entirely to her position in the caste system, her mobile number is now keyed into the memory of my mobile phone as “Soni Witch”, just in case she calls. Which, undoubtably, she will, as she spent the remainder of the morning, once she had paid to get the NDTV cameras out of police custody (they had not been warned by Autocar nor by Hindustan Motors PR girl), calling us and begging to meet. When we finally agreed to meet at the Club (that I suggested she pay her entry to rather than expecting us to as she was prepared to do) she profferred gifts, and told us how she wanted no PR but that HM would help us in every way possible. “What more can we do to help you?” she purred. She was on our territory and realised that we could seriously upset her PR work to date if she upset us yet further. Wisely she decided not to risk it, only dipping slightly into the sour milk when her PR company called a gossip-filled tabloid in an attempt to scandalise our arrival. It resulted in an unpleasant article misquoting me and making up the “facts”, no doubt based on the story told to them by Hindustan Motors PR company. The whole crazy incident has introduced us to a side of India and its caste system one cannot begin to understand as a tourist, possibly one best not experienced personally, if at all avoidable. Joanne woke with a migraine, probably due to the tension yesterday morning (due to disagreements with Hindustan Motors over how to handle the days events) and the easing of that tension last night – medication worked but unfortunately meant that she was not able to give blood to the Bombay Red Cross Blood Bank as Tim did this morning. 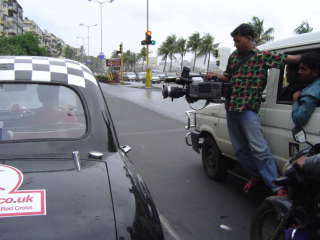 After driving up and down Marine Drive a few times as NDTV filmed us for the “ Car and Bike Show” we paid another visit to the Mumbai Red Cross. This time some of the 35 thalassaemic children who receive regular treatment at the Bombay Red Cross Blood Bank were there and Ashish Vazirani, 32, told us a little about the genetic disorder and the regular drugs and blood transfusions he requires to remain alive. “I’m not a vampire,” he said, “ but I require a pint of blood a week to live”. 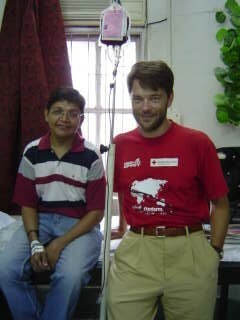 Treatment is costly but the Red Cross charges according to the ability to pay and some are treated at no cost. We were pleased to accept Dr Nainder’s offer of lunch with the staff. In addition to the butter chicken, saag paneer (while cheese in spinach), chicken biryani and parathas that was bought in we sampled small amounts of homemade dishes as the staff had each brought in their own lunches, each dish in a separate tin or box then packed together. We reluctantly left after an unexpectedly enjoyable relaxing interlude in the midst of a hectic timetable. Calling in at Prudential Shipping we paid our bill for the costs of getting Florence out of the container and through customs (the majority of which were “inducements” to those involved in the process) and thanked Faroukh and Vispee for their much-appreciated assistance in the convoluted and complicated process. It would have been considerably more costly, too, had they and Safmarine had not been as generous with their services. Our presentation at the Royal Bombay Yacht Club was very successful and we met some interesting people. 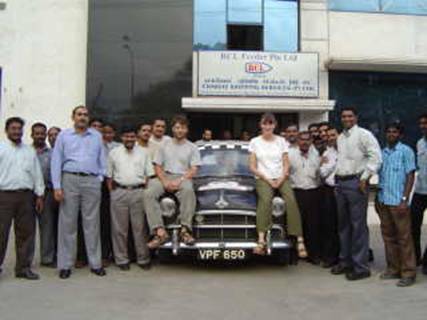 Tim took Florence in to the Hindustan Motors garage at Cotton Green, Fort Point, about forty-five minutes drive from South Bombay where we are staying, for a days servicing. 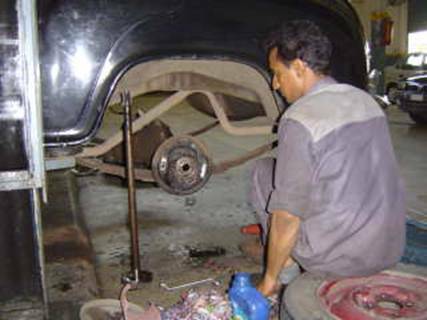 We met with the Hindustan Motors Territory Service Manager a few days ago and ran through the list of work we would like done on the car while we have the benefit of mechanics who regularly work on similar cars using many of the same spare parts. In order to ensure that the work is carried out correctly on the car, using new parts not old, and that it is worked on in an efficient manner, unlike the last visit, Tim spent the day with Florence. CNBC, a national TV channel, interviewed Tim at the garage and did some filming while the car was being worked on – apparently the programme will be broadcast one evening next week. We have managed to get copies of some of the press coverage we have had so far in Libya, Egypt and now India but have not succeeded in getting recordings of the TV pieces about us on CD rom so that we can watch them. It’s a shame because every now and then people tell us that they have seen us on TV, like last night when a couple of women rushed up to shake my hand and excitedly tell me that they’d just seen Tim and me on TV, but we have missed it every time. The Oberoi hotel had offered us almost a week’s complimentary accommodation from last Saturday but as we only arrived on Monday I had asked if they could consider revising the dates so that we could extend our stay until Sunday, rather than having to pack our bags again and leave today. We were relieved to hear from the sales manager this afternoon that we were welcome to stay until Sunday – phew! We’re most grateful. It’s been a tiring few days: we have spent so much time organising, planning, meeting potential sponsors, giving presentations, sorting out shipping and customs, working on the car, visiting the Red Cross, meeting the media…that we do not seem to have had a lot of time to explore Bombay. When we first arrived we spent some good relaxing time with new friends Jan and Rashid and Koen, Stella and Nathan but it’s all been a bit of a rush since then! We have, though, made some good progress on planning for our journey from here to Australia and have met many friendly and interesting people and, in the process of all of our busyness, have we begun to get to know Bombay. More work on the car in the morning then filming with CNBC in the afternoon. Health and safety clearly is not an issue here – the cameraman was literally strapped to the side of their car with a seatbelt out of the window in order to get a shot of us driving along side! They were fun to work with though. Superb Thali meal at Samrat restaurant in the evening – an “all you can eat” meal with lots of different dishes, breads, rice and desserts that are regularly added to the plate. Just when we thought we were doing well the waiter came along with something else or a top-up of a dish we’d finished. 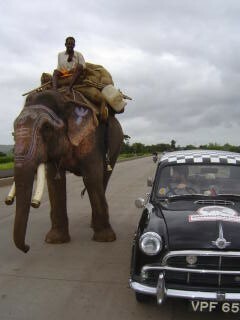 We had so much still to do in Mumbai but we felt that we had to get on the road. 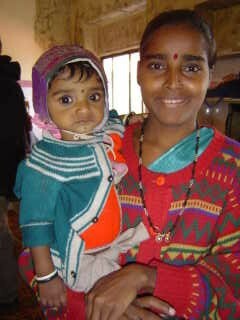 However, we could not leave without seeing the friends we had met when we first arrived in India. We met Doctor Shah for a late breakfast and coffee and he very kindly gave us a few weeks supply of homeopathic medicine to boost our immunity. 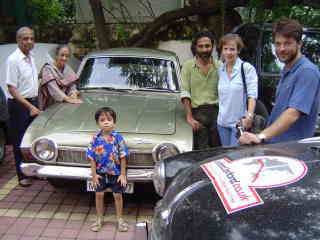 We then drove up to Bandra and had a late lunch at the home of Mr and Mrs Ali, parents of Rashid. Jan, Rashid’s wife, is the sister of Sue, who is a friend of Tim’s from Ireland and we had spent a day at Jan and Rashid’s home, just near his parents apartment, when we first arrived in Mumbai. Mr and Mrs Ali have a Corsair that they imported to India from England via Cairo in the 1960’s. Rashid led us on his scooter out towards the start of the Mumbai-Pune Expressway but, despite this start and a detailed map that he had drawn for us, we still had to ask directions from people admiring Florence when stopped at traffic lights. Unfortunately, we had not made it as far as Pune before it got dark: winding up the Expressway through a traffic jam caused by a landslide which closed part of the road, in the dark and wet was a challenging start to driving in India. Even the toll Expressway of which locals are proud was potholed and rough in places after the unusually heavy rains. We had booked accommodation at the Western India Automobile Association “guesthouse” in Pune so were most frustrated when, tired after a challenging drive and navigation into and through the town, we finally persuaded the security guard for the block to take us to the AA office only to find that it was locked. No-one answered the phone and the person at the head office in Mumbai, though saying that he had phoned the man at Pune, had, we realised later, promised but done nothing to help contact the night duty man who was responsible for letting us in, through the offices to the guest room. After calls to the Presidents of the WIAA, who were very helpful and did as much as they could given that they are in Mumbai, not Pune, (in fact the Regional President was not even in India at the time! ), we gave up and started getting ready to sleep in the car. With intervention of a young man who said he was a social worker the were allowed to park the car in the inside car park underneath the office block. Just before midnight when we had just cleared the car seats and sheet sleeping bags were being laid out, the friendly social worker returned with a security guard who had found the mobile telephone number of the AA night duty man. Ten minutes later he arrived and let us in to a twin room with basic but adequate facilities and most importantly a bed on which we could stretch out and sleep rather better than in the car! We woke feeling more relaxed than we had for a couple of weeks and laid listening to the birds, frogs, squirrels and a variety of other dripping wet forest sounds until a knock at the door signalled that our “bed-tea” had arrived. By the time we had showered Father Tomy had arrived to eat breakfast with us before we began our tour of the Bel-Air Sanatorium. 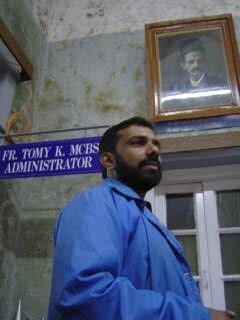 Ten years ago Father Tomy was preparing to depart India to begin studying in Belgium when he happened upon Bel-Air. At that time it was a barely functioning hospital with virtually all the historic buildings dilapidated, the few staff desperately struggling to care for patients and the 44-acre estate overgrown and neglected. He determined to make the place a success and approached the Red Cross in Bombay who no longer had the resources to run it. The Red Cross accepted Father Tomy’s proposal that the MCBS (Missionary Congregation of the Blessed Sacrament), run the hospital as a Red Cross concern. Father Tomy is the Administrator and is now assisted by Father Joseph who runs a school nearby, and Jacob, also Keralan Christians, and three nuns: Dr Rosily from the Society of Jesus Mary and Joseph and two nurses. He also employs nurses, many of who are Christians from Kerala but not exclusively, doctors and a host of support staff. Even though it is run by Keralan Christians it is a secular organisation with a staff of Christians, Hindus and Muslims. As a few of the staff went to the small chapel yesterday evening we could hear the Muslim call to prayer in the village. Many of the staff members have worked at the hospital for several years: an engineer, Mr Eruch D Ghadiali, is now 80 years old and has worked at Bel-Air for fifty-six years. Several, including the gentle smiling man, Prakash, who is responsible for looking after us, were involved in a mutiny a few years ago in which local staff members and villagers (many of who are illiterate) had been whipped into a fervour by developers and politicians who were not in favour of the estate continuing as a hospital. The situation brewed up until a young boy fell over in the grounds and Father Tomy picked him up, dressed the wound and sent him home. The rumour that he pushed the child over deliberately was sufficient excuse, it seems, for the opponents of Father Tomy and his plans to encourage the staff to turn violent. Nurses were attacked, buildings that were still standing were damaged and the calls for Father Tomy to be arrested resulted in the police taking him into a cell for his own safety. 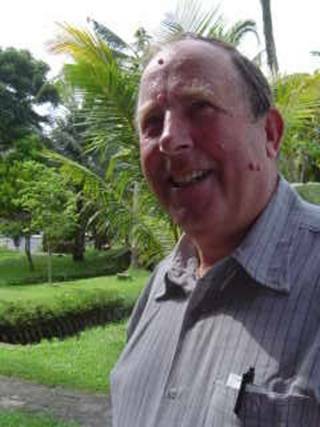 In another set back Father Tomy had to call a public meeting and effectively carry out a verbal public inquiry into an incident where a road accident caused the death of a Hindu doctor at the hospital which resulted in accusations that the Hospital did not save his life because he was not a Christian. Despite these and many more setbacks and struggles the Hospital is now established as a vital healthcare provider to the local community and in addition provides specialist care and treatment to those affected by HIV/AIDS and TB in Western Maharashtra and further afield. Maharashtra is one of the three states in India with the highest HIV prevalence. As well as treatment the centre provides psycho-social support in tackling stigma and discrimination attached with the disease. It has been recognised by the Central Indian Government and organisations such as UNAIDS and AVERT (USAID) as setting an example of one of the best practises in the treatment and prevention of the spread of HIV/AIDS in India. Learning from practical experience in the community they are now working to establish continued community support to patients including education for the wider community. "Treatment and care propels prevention" is one of their mottos. 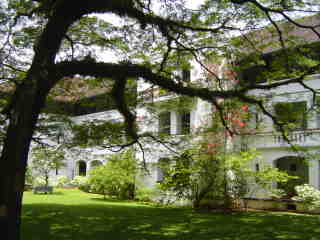 The Hospital was originally established by Dr R B Billimoria in 1914 on the “Dalkeith Estate” donated by Sir Dorabje Tata and became a world-recognised centre of expertise in the treatment of tuberculosis - in fact Dr Billimoria was awarded the MBE for his outstanding contribution to eliminating TB. It is therefore most appropriate that it has now become a recognised centre for the treatment of HIV/AIDS and TB, as well as being a general hospital. It has been an Indian Red Cross Society hospital since 1965. However, no funding, though pledged from USAID and the Indian Government for the next year, has yet been forthcoming this year and Father Tomy is struggling to meet the running costs with donations only. Patients pay or not according to their means and are treated to the best standard the hospital can afford. The community programme is aiming to encourage patients to come forward for treatment early rather than waiting until they are seriously ill and have possibly infected others. That means changing attitudes in the rural areas where “patient confidentiality” is such that the patient is “protected” from the hard truth of a doctors diagnosis and his family care for him, only taking him to the hospital when he has deteriorated. We met a family in one of the wards, the young parents and baby were all HIV+ and with treatment were almost healthy enough to go back to their village but the Doctor estimated that, as long term drugs are so expensive, the parents would probably only live for another ten years leaving the child, if she lives, an orphan. Many of the patients who were in a good state of health wanted us to take their photos and showing them the digital images caused great amusement and other people to beckon us to them. One man who was leaving today was determined that we took his photo with Fr Tomy – Rajesh Salve is going back to his village and will be monitored by the hospital to ensure that he continues to take the drugs and behaves as a responsible citizen. Other patients who are cleared of secondary infections have stayed at the hospital as staff. When Fr Tomy first arrived at Bel-Air patients were dying because there was no money available for the most basic equipment. In one moving story Fr Tomy recounted how a piece of equipment costing 5000Rs (approx £60) would have saved a 22 year olds life – he had just taken over as Administrator but had no funds so in desperation he persuaded a distributor to give one to him on credit and raced back on his motorbike only to crash into a cow in the dark. He was seriously injured, the equipment was smashed and the girl died. He was devastated but even more determined to succeed. Since taking on the responsibility for Bel-Air Fr Tomy’s efforts to raise and manage funds have varied from applying for grants from charitable trusts to breaking the local bakers bread cartel. One project designed to generate funds is an Ayurvedic and Naturopathy Centre that is in the same fabulous grounds looking down a stunning valley though accessed separately from the Hospital. The Keralan massage and treatments, which also include yoga, are good. 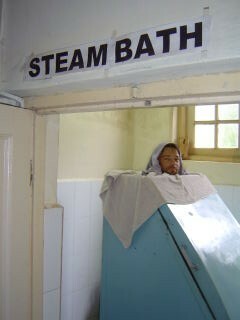 We tried out the warm oil massages and finished off with a “steam bath”. Tim’s intensive massage lasted for over an hour and worked on virtually every muscle and joint in his body. Two of the nurses gave Joanne a massage using the same warm caramel smelling oils and finished with an Indian head massage. It was then into the “steam bath” – a contraption consisting of a large box inside which one sits on a stool then the door is closed leaving one’s head, which is covered in a cold wet towel to prevent one from overheating, sticking out of the top. The box is filled with steam through a pipe connected to a pressure cooker sitting on top of a calor gas stove – basic and very amusing looking but effective! The centre is not sophisticated. There are 8 twin rooms, four with attached shower room, TV and phone; the others have shared fairly basic facilities. The location is great, cool (relatively) climate and the area, when not raining like now, has stunning scenery. The main building is surrounded by a lush garden where herbs and plants for remedies are grown and there are plans to build a yoga platform with views down the valley and near an organic garden. People do visit here for a few days of treatments but mainly from Mumbai and rarely from further afield. Fr Tomy recognises that in order to attract more people to the centre he needs to upgrade the facilities and is prepared to do that with the support of a sponsor as long as he sees a realistic potential market. We have asked the advice of a couple of people we know as it has the potential to be a lovely stop for a few days in a holiday itinerary or a base for a holiday in the area. We would not have found the waterfalls had we tried to navigate ourselves to the viewpoints; instead a driver drove us in one of the hospital vehicles through occasionally clearing cloud to the top of a valley about 45 minutes from Bel-Air. We did not hold out much hope of seeing anything as he guided us in the pouring rain on foot down a muddy rocky path then across a footbridge over a swollen river which we discovered moments later was at the end of a valley hanging hundreds of feet above the valley below. From a viewpoint a little further on as the clouds cleared briefly we could see that the water was crashing down from the river we had just crossed to the end of the valley below, it’s steep green sides cut with several other smaller waterfalls. It was unexpected and dramatically beautiful. 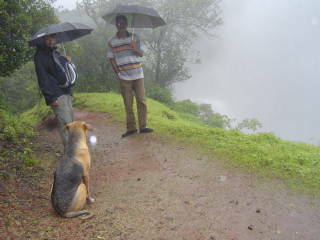 Accompanied by a dog that trotted along with us and sat and waited patiently whenever we stopped, we continued on, at one point taking off our socks and shoes to wade across a stream, to see another four waterfalls higher up all falling into what is apparently a scenic swimming spot when it is not the monsoon. We went back for a hot coffee instead. We spent the evening at the guest bungalow with Father Tomy regaling us with his opinions on Bush, Blair, Indian politics, corruption, tactics he has used to gain donations to Bel-Air, incidents at the Hospital…He is a very intelligent, well-informed, energetic man with a great sense of humour who works all day every day after only five hours sleep each night: quite an inspiration. Though we both work much better after a good eight hours sleep so at that point in the conversation we headed for bed. The journey down from Panchgani to Goa was long and tiring but interesting. We passed one overturned lorry that had shed it’s load of sweet corn across the road and a little later a group of people looking at bus that had rolled of the road into the undergrowth. No one appeared to be hurt in either incident but neither did anyone seem to be doing much to get the misplaced vehicles back on the road. The days journey took us past an elephant, monkeys, cows, buffalo, ox-carts and dogs…all on the road. From Panchgani we wound down from the cloud back the way we had come from the main National Highway 4 then headed south through overcast but clearer weather to Kolhapur. Initially dual carriageway the signs stating that it was a project of which the state was proud unfortunately marked the end of the completed road and the beginning of the road works, rough road and diversions on and off tarmac stretches into and out of the paths of oncoming traffic. It was not busy so we made it by lunchtime. Unfortunately, navigating our way out of Kolhapur onto the main State Highway heading west to the coast road was not so easy – our map showed only one road branching off the main road, not the maze of roads with which we had to contend. The very few road signs showed no hint of English and all of the people we asked on our initial attempt to head out of town pointed us the same way. That seemed fine until we realised that we were heading north again on the road we had an hour earlier come south on. We tried again and after many “straight, straight” directions that took us to cross roads and similar we somehow managed to find State Highway 115 that took us W/SW. The winding often very rough road wrecked by the rains took us through lush countryside, bright wet green fields and forests, then suddenly off the high plains into thick cloud and down and down steep switchbacks around jagged green peaks past the remains of mud rock landslides only just cleared from the road. 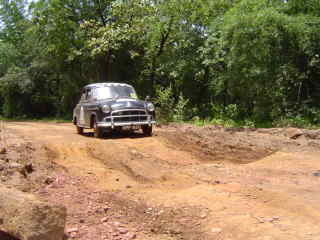 On one corner we tucked in tight to the rock face as half of the road, marked with rocks, had dropped away. Only the compass could confirm our route, few requests for confirmation from villagers resulted in accurate answers. As most rural people take public transport if they travel far, and many do not, it is hardly surprising that directions were rather vague. 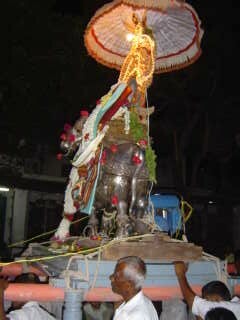 We passed few cars, an odd bus, taxi, auto rickshaw and ox-cart and many people on foot. Once we made it to the National Highway the road conditions improved and some of the signposts as well as having names in English also had the distance to the destination. Keen to get as much distance as possible covered before dark we were motoring along when a car pulled in front of us, flashed his lights and waved a camera out of the window – he had seen us on TV and wanted to take a photo with his son next to the car. Most amused that we are now “famous” we smiled at the camera! The road conditions and delay in finding the correct road out of Kolhapur meant that we had to drive for the last two hours of the journey in the dark. This is something we try to avoid and, though we were fine, our experiences in that short time confirmed that we must try to avoid driving in the dark in future. Dipped headlights does not seem to be a concept accepted here by many, lights are either off or switched on to full beam when a car is spotted coming the other way; cows and buffalo do not wear reflectors when they lie in the road; pedestrians walk in the road seemingly oblivious to traffic trying to avoid them while dodging the truck coming the other way and buses overtake each other on blind bends, up hill and even on straight roads totally ignoring the oncoming traffic. At one point a bus overtook another bus coming around a bend off a bridge straight into our path – if Tim had not braked suddenly and swerved our journey would have come to an abrupt end somewhere en route to Goa. After going up and down the road a few times we finally found the apartment where we were to stay with the help of Robin, the housekeeper running up to us, arms waving, in response to my phone call! A quick snack at a bar down the road and we went to bed. After our presentation at the Royal Bombay Yacht Club in Mumbai last week Lt Colonel Graham Tullet OBE kindly invited us to stay at his holiday home in Candolim should we make it to Goa. Running along an almost deserted stretch of palm fringed beach this morning we were pleased we had taken him up on his offer. We are sorry that he will not be joining us; he called us today from his hospital bed in Mumbai having just broken his hip to check we were ok! Masses of small fishing boats were out, not far from the beach, despite the rough sea. The strong undertows that prevented us from swimming have apparently caused some people to be drowned recently near here. Instead, we enjoyed having a splash around in the waves for a few minutes before walking back past bungalows and guesthouses in lush gardens to Colonel Graham’s apartment in the village. It is such a change from yesterday when we were chilly and damp, now it’s warm and sunny. The monsoon rains have been heavy in Goa too, apparently, but today the sun shone all day. The tourist season doesn’t start here until October/November so the area is very quiet and we have not yet seen any tourists. We decided not to drive anywhere today after a long and tiring drive yesterday so Joanne and Robin, the “housekeeper”, bought some food locally and we enjoyed having the use of a kitchen in which to cook for ourselves as well as clothes hand washing facilities and a balcony to do some laundry. Some days it’s good just to do domestic stuff! A little jog to along the beach became a three hour-long trek to the end of the headland in a vain attempt to see the view from the 17th Century Portuguese Fort Aguada. We ran along the road through villages then wound our way back along a narrow track around the before walking back along the palm-fringed beach after a cooling-off splash in the waves. Looking down from the grassy headland to the small cove at the base of the cliffs reminded us of Cornwall. Other than taking the car to the beach so that a photographer could take pictures for a Goan Sunday newspaper, The Gomantak Times Weekender, we didn’t drive anywhere. Instead this evening we headed back up to the Fort by scooter – very amusing and much easier than on foot! Many people were dressed up smartly and on their way to Church as we wound our way through the lush lanes of Goa from the village of Candolim towards the main road heading inland. Goa remained a Portuguese colony from the 1500’s through the days of the British Raj and still retains many Portuguese influences. Names on doorposts are frequently De Souza, Fernandez, De Silva and there is a significant Christian community. 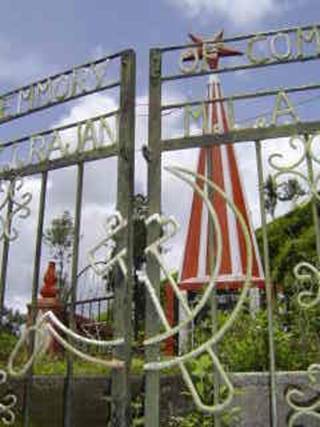 There are crosses at entrances to many houses, small shrines, similar to the Hindu ones nearby, convents and white ornate churches that stand out from the palm trees surrounding them. As we drove through Old Goa we passed immense churches, like cathedrals in their grandeur and were sorry that we could not spend more time exploring Goa. We had been advised to drive down the coast to Karwar then NW inland back up to the main road East – this detour would have added at least 70-100km onto the route and would have been on a lesser road than a National Highway. We took the direct National Highway (NH) heading east which was initially reasonably good though we encountered some rough potholed sections as we dodged trucks winding up through dense vegetation and passed trucks stopped on corners while their drivers washed in roadside waterfalls. At the junction where we expected the diversion we had been advised to take joined the road we were on the NH veered North and we, as we had been advised, did not follow it as it would have involved another detour of approximately 70km north. Instead we drove east on the road signed Hubli, the halfway town on our route to Hampi from Goa. 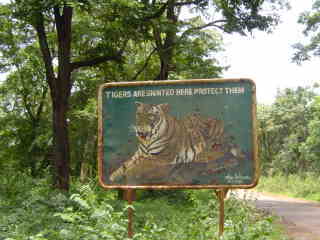 The one-track road through pretty countryside, farmland and nature reserves where, according to the signs, tigers still roam, was almost impassable in places. This 58km stretch of road was beyond doubt the worst we have encountered and some stretches were at the limit of Florence’s capability. Only trucks and 4x4s would deliberately choose a road they knew to be in that condition. We thought that this was the stretch of road that we had been advised to take but with hindsight the drivers might have meant us to take the road beyond Karwar which would have been further still but would have avoided this stretch west of Hubli. Only someone who had never driven it would have advised us to take this route. In many places, particularly through the forest, the patched tarmac had broken up or vanished altogether leaving gaping irregular muddy gaps across the route that we had to carefully negotiate, one of us guiding the driver through the worst holes. It was difficult to avoid hitting the sump guard on occasions and the number plate had to be bent back into shape after hitting a particularly challenging lump of tarmac as we emerged from a hole over a foot deep. To our surprise the road from Hubli to Hospet, the nearest town to the village of Hampi, was in a relatively good condition, some rough patches and an odd pothole filled in with stones and soil and it was even marked in places, so we were able to make good speed during the afternoon. We still had to negotiate Hospet at dusk, which was challenging but the policemen at junctions were helpful, and Hampi in the dark. Following a sign to Hampi we drove carefully along rough tracks, flagging down the odd oncoming vehicle to check directions. Once at the village we had to park in the main carpark outside the guarded gates into Hampi Bazaar where boys immediately swarmed around the car insisting that we see their guesthouse. They could not resist leaning on the car, pulling at the wing mirrors and fiddling with the doors but a firm word stopped them, briefly. 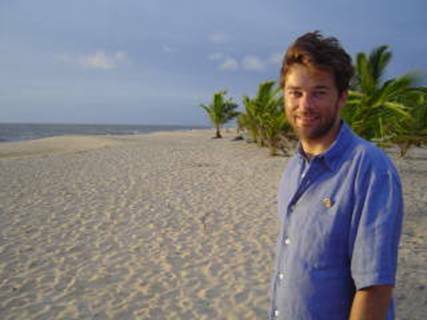 For this reason and our concern for the security of the car Tim stayed with Florence fending off interested children and adults while Joanne went into Hampi Bazaar with three of the “guesthouse boys” to check out what sort of accommodation was available. Though recommended in “The Lonely Planet Guide” as “a gem” the first guesthouse only had what was described as a “common room” left, that is one with a bumpy platform bed and shared outside squat loos; apparently tomorrow was fully booked so that was an easy decision to make. The next guesthouse she was shown was marginally better but the bed had no sheets and the mosquito net looked rather holey. Another had a reasonable room, also for 150Rs (about £1.80 per night not including breakfast) and we could have parked the car in the narrow street in front of the open room where the owners sleep. Finally, having realised that the security of the car was of prime concern, one of the boys took Joanne to see the Pushpa Guesthouse, a friendly family home with two guestrooms, each with its own cold shower and loo (no basin, just taps), mosquito net and fan. Most importantly there were gates behind which we could park Florence right next to the house. It was well worth the 100 Rs more per night. 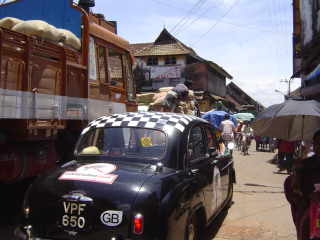 Other than an odd auto rickshaw on the main street Florence was one of the few vehicles to drive through the bazaar area; most vehicles park in the car-park outside the gates to the main street but we managed to get permission to drive the car in on the condition that it was parked behind gates. We were very happy to comply with that and lucky to have found a suitable place to stay where the car was tucked away next to a family home. Getting the car through the narrow streets was a little challenging though! We were hot and tired by the time we finally got parked and into the guesthouse so we shared a Thali for supper, talked to our hosts who were amused by the car, had a short walk to the temple and went to bed. We ate breakfast on the roof of one of the small houses in the village (the place is full of houses offering “rooftop restaurants with views” that sound much more special than they are) prepared in what appeared to be a small family kitchen as the daughter of the household prepared to go to school and people walked along the street below to wash at the river ghats (wide steps down into the water) at the edge of the village. Hampi is the ruined capital city of the Vijayanagar Empire, one of the largest and wealthiest Hindu Empires. It was founded in 1336 and abandoned in 1565 when the City was ransacked by a Muslim Coalition. 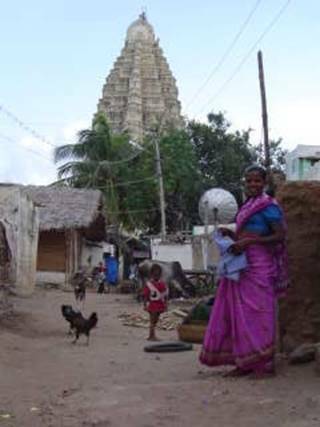 In recent years Hampi Bazaar, one of the wide main streets of the ancient city, has been re-occupied with homes, stalls and small “hotels” (offering food but not rooms) filling the gaps between the remaining stone pillars lining the street. The few narrow streets running behind the main street are full of small homes offering food and basic accommodation. There is certainly nothing sophisticated about the place, but it has its own character that is very different from anywhere else we have been. 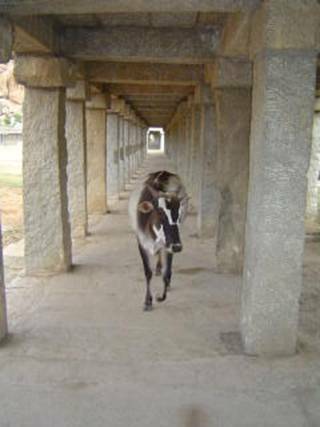 The street around the edge of the temple is paved, as it would have been when it was first built, the other streets are mud, wetted and brushed over with wet cow dung which dries leaving a hard bug-resistant surface on which white patterns are freshly chalked twice a day in front of each doorstep. Cows amble at will around the area and are petted by people at their doorsteps, chickens strut around the street and monkeys try to steal food. There is even an elephant that bathes in the river in the morning then spends the day at the temple “blessing” worshippers with a “smooch” from it’s trunk! On the main street we watched as a monkey managed to grab a bunch of bananas from one of the many banana and coconut sellers, dashed up on to a roof and ate six bananas in seconds, watching all the time for a thief! 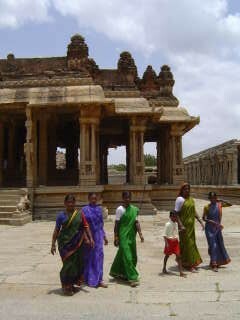 There were few tourists as we explored some of the huge ruined city, much of which is still under excavation, but we ran into minibus loads of Hindu worshippers at various temples. It is still a site of Hindu importance with many impressive temples, most in various states of ruin, and areas of pilgrimage. The Vittalla Temple is one of the largest and is a UNESCO World Heritage Site. In the large courtyard is one central roofed area and one smaller one. The stone roofs are supported by intricately carved pillars some of which “chime” when struck. Also in the courtyard is a stone chariot, the wheels of which even used to turn. The city is built amongst and from huge boulders forming hills of massive reddish granite boulders balancing precariously, one would think, on top of others. We could see evidence of enormous blocks having being cut from the hillside by chipping along a line and cracking the rock. It is difficult to imagine how these enormous slabs could be moved and made into the impressive buildings still evident today. We crossed the wide, brown river perched in a “coracle” – a round boat of about 5 foot diameter made of reed and waterproofed (sort of) with a tar-coated tarpaulin type material. As it was paddled by one man it went first right then left, spinning slightly as we crossed the flow of the river. The vague path on the other side led us across what had once been an ancient stone bridge that had fallen down to become stepping stones and to a small house at the foot of a path up to another temple at the top of a hill. The “Restaurant and coffee shop” signed at the house was officially closed because the tourist season has not yet started but we were offered dhal and rice with soda followed by chai. We had timed it well because the family were just about to start their lunch and we ate the same thing. Back across the river again we scrambled along the boulders along the riverbank finding remains of small temples, platforms at the water edge, numerous ornate carvings of the elephant god, Ganesh, simple figures of people with their hands above their heads and their hands together, and other shapes we could not decipher. 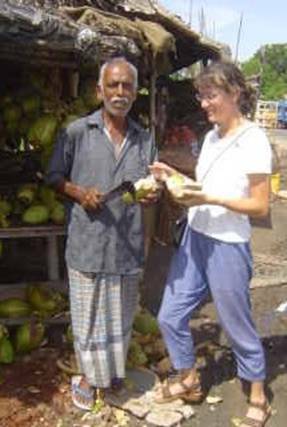 Joanne had good memories from her last visit to Hampi about eight years ago of walking from Hampi Bazaar over a hill and seeing the remains of an ornate temple amongst coconut palms and banana trees. Determined to show Tim we set off up a path of stone steps climbing up and up the highest hill of the area – there were great views back over the temple, ruined bazaar stretching down to smaller temples next to the river but it was not the gentle path Joanne remembered. As we reached the top the path was marked in white chalk along the sloping edge of a shiny granite boulder that sloped away to a drop of hundreds of metres. A little concerned we edged inside and underneath other boulders to avoid the close edge only to find that the way down was down an even steeper and narrow path of shallow well-worn steps cut into the rock with a serious drop down one side. Following a couple of religious men (you’d need to have faith to walk down there in flip-flops as they were doing, quivered Joanne whose palms and foot soles are sweating now at the thought of it!) Tim bravely stepped down but Joanne, after a few steps and a quick look down, wimped out and turned back, convinced that there must be another way. Some people were sitting at the temple just above us so we scrambled back up and under the boulders, across another precariously sloping rock and found some more steps that took us up to the temple. We were so relieved when the girls confirmed that there was another path down, still with a steep drop but made of ancient wide granite slabs that zig-zagged all the way down – phew! The “The Mango Tree” restaurant was well worth the evening walk along the river past the ghats and through a banana plantation. It is a really laid-back place, literally: we sat on rush mats laid out on terraces underneath a huge mango tree overlooking the river and ate thali off banana leaves at low tables lit by gaslight. (The thali was simple but great value at 30Rs). Watching the bats whiz through the trees and listening to the buzz of the forest around us was very relaxing and quite magical. Swatting mosquitoes was a bit irritating as the sun set but a mosquito coil and incense warded them off quite efficiently. We got back into Hampi Bazaar just in time to see a lively and noisy procession of people following the temple elephant walking and a statue of Nandi, the bull god, (lit up with power from a generator strapped to its back) being carried towards the temple. Children were dancing around firecrackers, people were worshipping flames carried in a bowl, a band were playing chaotically and the elephant strode on into the temple followed by the general procession. Despite these full-moon celebrations of Raksha Bandhan festival (full moon day when girls fix amulets knows as Rakhais to the wrists of their brothers to protect them in the coming year) many people remained asleep all around the main courtyard of the temple and cows wandered around them. Apparently many people visit and believe that it is good to sleep in the temple or in one of the ashrams nearby for one night – many of them seemed oblivious to the procession going past them to the inner temple where a small ceremony took place. 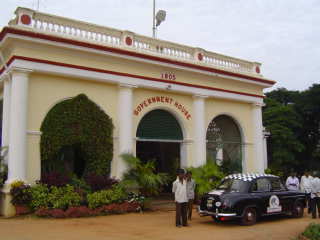 The Bangalore Club was built in the early 19th Century as a British Officers Mess, a grand building with stables in its own grounds. There was no accommodation so the officers lived in bungalows around the area, each with their own butler who managed their domestic affairs. Some of the guestrooms at the Club nowadays are in the old buildings but most, like the room we are staying in, are in an unattractive purpose built building. Even in the 1800’s British Cavalry officers needed their own income in addition to that given to them by the Queen: according to Sir Winston Churchill, who was based here as a Lieutenant, “It was, however, better in a Cavalry regiment in those days to supplement the generous rewards of the Queen-Empress by an allowance from home three of four times as great. Altogether we received for our services about 14 shillings a day, with about £3 a month…This together with £500 a year paid quarterly, was my sole means of support: all the rest had to be borrowed at insurious rates of interest form the all-too-accommodating native bankers.” From “My Early Life 1874-1908” Sir Winston Churchill. Some of the rules of the club seem to date from Sir Winston Churchill’s time and, unfortunately, a copy is not given to guests. This morning our transgressions - wearing t-shirts, having papers out and having a laptop open – got us thrown out of the main building. Luckily, the staff reaction time was slow enough to allow us to conduct an interview with “The Indian Express” before we were asked to leave. We gave up on the coffee we had ordered after half an hour of waiting and conducted the next interview with “The Hindu” (another Indian national paper) at the swimming pool garden – we were allowed to have paper and pen out there! 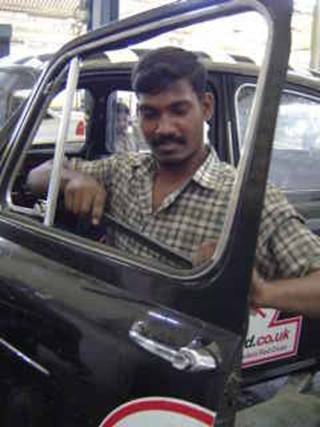 We spent the afternoon at “Southern Motors” hosted by Prem Kumar, the manager of the Hindustan Ambassador service section: The Times of India local correspondent interviewed Joanne while Tim monitored some initial work on the car. The bar where we drank a G&T before dinner was reminiscent of an old officers mess, though it had been refurbished fairly recently, wood panelling, leather button back chairs and a fireplace, not used, the air con was on instead. We went to the mixed bar, of course, no ladies or children allowed in the men’s bar – apparently the sign outside the door to the men’s bar used to read “No ladies, children or dogs” until an influential lady member threatened to sue the club! The dining room, where we were served paratha, butter chicken, mixed dhal and rice, is grand with a high ceiling and arch through to the central foyer. A small, air conditioned room just before one enters the dining room is “The Buttery” where a formerly dressed waiter proudly showed us the menu which included “fish and chips” and “Beef and potatoes” amongst other western dishes. It was more expensive than the main dining room, which was good value, and did not appeal to us but is apparently popular amongst members. The main foyer/central sitting room appears to have changed very little since the days when the building served as a British Cavalry Officers Mess. 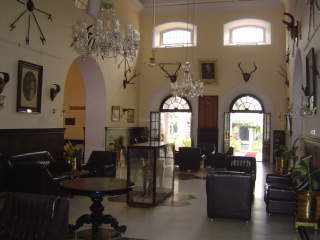 The walls are adorned with antlers, pictures of India in the 1800’s, important figures such as Major General Stringer Lawrence (First Commander in Chief in India 1751-66) and the Nawab Wallajah (Nawab of the Carnatic 1749-94), and hunting pictures, such as a photo of a proud fisherman holding a huge record-breaking fish caught locally. Taking pride of place in the centre of the room, amongst the leather chairs and oak tables, is a stuffed leopard in a glass case. The room illustrates an India that has changed dramatically. We had been told that we would probably have to check out of the Club today because it was fully booked, as it had been for the last two nights but no shows meant that we could stay on both occasions. A Club member, former President of the Indian Film Association and freelance journalist, had seen us in the paper and asked us at breakfast how long we were staying…moments later the receptionist told us that we could stay at the Club for another two nights. We are really pleased not to have the hassle of moving to a hotel that would be more expensive and inferior but the sudden change of accommodation status reinforced the feeling that reciprocal members are treated as second class when we would have expected reciprocal members to be welcomed. Florence had remained at Southern Motors garage overnight and Tim was determined that work on her would not start until he arrived to supervise. He was a little irritated, therefore, that when he arrived late because the garage driver had not arrived when agreed, they had started work. The Ambassador department manager, Prem Kumar, who had welcomed us yesterday and whose department was responsible for working on Florence understood that Tim wanted to see the work that was being done but the boss was in today and he kept calling Tim to his office where Tim politely drank tea , tried to remain calm in the face of the bosses patronising attitude then escaped again to the servicing bay. Tim was told that he should not be driving the car around in the garage; he replied that he does so because he is the only one who knows how to engage reverse gear because it is different to an Ambassador. The boss’s insistence that Tim was wrong was undermined when he called one of the members of staff who said, rather bravely given that disagreeing with the boss is not often done in India, that he could not find reverse on Florence. Replaced a bush in the starter motor ‘bandex’? Tim and Florence just made it back to the Club in time to pose for photographs for “The Hindu” national newspaper. We have got used to photographers trying to find unusual ways to photograph us but this was the first time that we had been asked to drape ourselves over the bonnet and roof of Florence – still it got some attention: a couple of members took photos of us being photographed and Tim lifting Joanne up onto the roof. Some of the spectators were a British family who now live in Hampshire but are originally from the Bangalore area and were staying at the Club for a few days while they see their relatives. Intrigued by our escapade Bosh and his wife invited us to join them, their children and their mothers (both from Bangalore) for a beer in their suite. We ended up staying for a light supper of tandoori chicken, crispy prawns wrapped in bacon (from the Chinese menu), salad, sausages and na’an bread ordered from the dining room and had a fun evening. Today started off cloudy but the rain stopped and the sun came out after breakfast; apparently it never gets too hot or too cold in Bangalore and it rains sufficiently to keep the parks lush and green. In our short visit here we agreed that the climate was ideal and that Bangalore, despite being a busy city with too much traffic, would be a good place to live. Especially if one belongs to a club like the Bangalore Club, in the centre of the city, with a good gym, tennis and squash courts, and a large swimming pool ideal for swimming lengths before work. We both miss swimming and are not exercising as much as we used to so we were pleased to have the opportunity of swimming in a large but reasonably quiet pool each of the three mornings we were at the Club. After a breakfast of masala dosa (large lentil flour pancake stuffed with potato cooked with onions and curry leaves) and khara bhath (pounded saffron rice cooked with spices and vegetables, a little like a small mound of risotto – someone will probably correct my explanation! ), we met a photographer from AFP who took a few photos that he will share with Reuters. We hesitated over our last minute packing, and considered staying an extra night – we hadn’t seen much of Bangalore and we have much to catch up on. The boot of the car has still not been reorganised since we got Florence out of the container and we have many e-mails to send, notes to write and accounts to update so we were tempted to stay put for another day. However, we were conscious that we are already behind in our schedule. Our decision was made when we spoke with the Principal of Hebron School, Ooty, who had invited us to make a presentation at the school in the next few days. He said that Saturday would be an ideal day for us to speak to some of the pupils and suggested we stay a couple of nights at the school so that we have our “admin” day there. We therefore had to get to Mysore tonight in order to reach Ooty by early afternoon tomorrow. Yesterday Tim had met Santosh Koshy at the club who had invited us for dinner or lunch at a restaurant owned by his family but as we had not yet made it there, when he met us this morning he asked us to call in for coffee on our way. We duly parked Florence outside “Koshy’s Café and Restaurant” on St Marks Road and were surprised to find that it is a big place - a large café with a separate restaurant next door and a bakery shop on the corner. Mid-morning was definitely the most interesting time to be in the café: most of the patrons looked as if they had been calling in for a Koshy’s coffee every day for years. There was a steady stream of attorneys in their black and white outfits from the nearby law courts and a variety of different people who called in for drinks or snacks. We were invited to join a group of regulars who stop by daily to drink a coffee and discuss life, religion, politics, animal welfare…everything and anything it seems. A filmmaker also joined us and his friend, an Indian whose grandparents in the mid-1800’s had been sent as slaves to work on the sugar-cane plantations around Durban, South Africa. He now spends several months a year in India, which he feels is his spiritual home, studying Indian traditional drum music. The topics of discussion over coffee jumped from classic cars, to making films, from Indian music to a recent visit to the café by a group of westerners who wanted to set up a centre in Bangalore to welcome people from outer space! 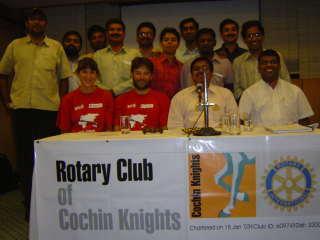 The Koshy regulars remained surprisingly open-minded about their theories. Then the topic of conversation changed to that of snakes: apparently the Koshy family home used to be the place where injured animals were taken to be cared for and members of the family would be called out to rescue wild animals, including snakes. Now there are several animal welfare organisations in Bangalore but Prem Kosy is still known as the “Dada” of snake catchers so is frequently called upon by people who find snakes in their homes – his aim is to save life, firstly that of the people and then that of the snake. He is respected as one of the few people capable of dealing with poisonous snakes. We were shown pictures of some of the snakes prevalent in the region including the Common Vine Snake, the Sand Boa, Indian Rock Python, Keelbacks and Rat Snakes. His account of a recent rescue was interesting – when he reached the sixth floor apartment to which he had been called to catch a rat snake (it was likely to have climbed there after a rat, apparently) it threw itself off the balcony. It puffed up so that when it was caught on the sheet held out below it was uninjured and escaped into another apartment. Prem eventually caught it and took it away but it was a long process. We haven’t seen any snakes yet and would rather not as we would not recognise whether they are harmful or not and there is rarely a friendly Mr Koshy on call. The large room of the café with its beige walls and wood panelling, black and white photos wonkily hung on the walls next to large mirrors, has a hint of “Chicago” about it, though is clearly India. Prem had spent several years in America and returned to take over the restaurant business jointly with his brother, Santosh, from their parents. Koshy’s was first established in 1940 and has become a family-run institution with Koshy coffees justifiably famous. They even keep mail for visitors, a kind of Koshy poste-restante. We were treated to fruit-cake, cream coffee, smiley-faced potato puffs, spicey chicken puffs and best of all, ice-cream coffee laced with chocolate – absolutely divine! It was hard to leave but we did so, almost two hours after arriving, with a packet of “Koshy Grandma’s Ginger Kookies” which are particularly good. We ate some with tea when we stopped later at the remains of the fort at Srirangapatnam. Mughal leader Hyder Ali and his son Tipu Sultan ruled much of southern India from their capital at Srirangapatnam during the 18th Century until 1799 when the British conquered them with the help of local disgruntled leaders. Much of the fort was destroyed by the British but some of the ramparts remain and an overgrown dungeon where British officers were held captive. The death of Tipu Sultan marked the start of British territorial expansion in southern India. We arrived at Mysore early evening where a friend of Santosh Koshy had booked us in as his guests to the Sports Club. In the forests on the outskirts of town the Club was originally a hunting lodge belonging to the Maharaja, according to a member of staff. Though, given the grandeur of the many palaces belonging to the Maharajas and the fact that several buildings of the same style that surround the Club buildings are now the Police Training Academy, a hospital, government offices and a hostel it is difficult to believe. The Maharaja was certainly involved as a picture of the most recent Maharaja takes pride of place in the Club, above a stuffed sloth bear and flanked by deer heads. The place was deserted except for a few members of staff who ambled around doing very little. We were surprised to hear that its facilities stretched to billiards, cards, and badminton. Still, it is clearly popular and when we returned in the evening after dinner there were several groups eating on the lawn, in the dining room and several men in the bar. Unfortunately, Mr Abraham, whose guests we were, was out of town so we could not meet him but we were grateful for his hospitality – it was a very quiet place to stay (the wire on the windows was to prevent intruders of the monkey variety), the beds had fitted mosquito nets, we had a ceiling fan and en suite shower room, and could park Florence just in front of the verandah. The sun was setting pink behind the white peaks and onion domes of the vast Indo-Saracenic Maharaja’s palace as we drove around the centre of Mysore. The palace was designed by Henry Irwin and completed in 1912 at a cost of 4.3 million Rs. Mysore is a small town with wide roads, circles and crossroads and several elegant buildings. Joanne stayed in a beautiful old hotel converted from a palace on her last visit to Mysore in 1994 and was disappointed to find that it is under renovation and not listed in the guidebook. Instead we ate a very good evening meal (chicken biryani, dhal with spinach, potato stuffed paratha and mixed raita) at another former palace. The Princesses Palace has been converted into “The Green Hotel”- it works on traditional environmental principles, using fans instead of air-con for example, has beautifully furnished rooms with restored furniture, charges reasonable rates and the profits are donated to local charities. It would be a lovely place to stay for a few days on a holiday. Though we only had a short time to see Mysore we were keen to see the former British Residency – a “Tuscan Doric” building set in twenty hectares of gardens and dating from 1805. Sadly, the gardens are not laid out now but the building is reasonably maintained as it is used as the Governors residence whenever he is in town. We were surprised to be able to drive straight in and park at the main entrance and even more surprised when a group of staff came out to greet us. They asked the usual questions about the car then the man we took to be the caretaker showed us around the house proudly pointing out the original features and the fittings and furniture that had been made in England two hundred years ago. One could imagine the elegant drinks parties that had been held in the grand high-ceilinged room looking out over the garden. We were saddened to find, close to the Residency, the building that we believe had once been Wellington’s house. It is now no longer mentioned in the guidebook and, though an elegant smaller version of the Residency set in its own garden, it is dilapidated, overgrown and the Wedgwood-blue paint inside the porticoed entrance is peeling and mouldy. The signs at the front state that it is owned by the “Council Tax Department” but it is clearly not used or maintained. What a shame. The road to Ooty (Udhagamandalam) from Mysore took us through the Bandipur National Park, once the Mysore Maharaja’s private game reserve, where we saw spotted deer and a wild elephant and Then up a road we had been advised by some not to take: winding around 37 switchbacks we climbed quickly to 2250 metres. As we drove past a Hindustan Ambassador with its bonnet up Florence’s temperature guage was nearing the top but she made it. We arrived at Hebron School just in time for a late lunch over which Alastair Reid, the Principal, told us about the school. It is a Christian International school teaching the English curriculum and the majority of pupils are children of Christian Missionaries working mainly in Asia. It’s reputation for good academic achievement and extra-curricular activities undertaken in a Christian environment with strong family values attracts people from other backgrounds including Muslims and Hindus. The Bose family who send their son to the school from Mumbai introduced us to the school. The school is housed in several buildings with children living in dormitories supervised by house-parents from England, New Zealand, Australia and India giving a homely but international feel. We did our first presentation to the girls at Selbourne House, an attractive building that was originally built as a sanatorium, and had mugs of tea with cake and chocolate donuts – a real treat! After dinner in the main dining room we gave a presentation to the sixth-formers and some of the staff in the staff-dining room. It was a fresh morning with the sun just breaking through the clouds as we jogged back down through the Botanical Gardens, having walked most of the way up the steep muddy tracks through the Toda tribal village behind the school to the top of the hill in the eucalyptus forest. The eucalyptus trees were imported (probably by some Australians missing home) when Ooty was first developed as a hill station and have now become a weed, sucking water and goodness out of the ground in an area where water is precious. The Botanical Gardens, just next to the school grounds, were founded by the British in 1848 and are still well maintained and popular. The British established Ooty as a summer headquarters of the Madras (now Chennai) government in the early 19th century. The Americans and the British used Ooty during the wars as a healing retreat from the heat and the associated illnesses of the plains. Much evidence of this colonial history remains including historic cars such as the Morris Eight brought to the school by the local Traffic Officer who had heard of our arrival. The pupils at Hebron School have a choice of Christian service on Sundays: the Sunshine Dorm girls attended a service in town, some children joined a discussion group in the small chapel in the school grounds designed by the famous architect, Laurie Baker. We joined the majority of the school at the main service in the school hall. This week a group from Trivandrum lead the service with lively Christian rock music that had everyone on their feet singing and clapping. We were surprised to be served roast beef and potatoes for lunch; we haven’t had that for a while! It was raining as we drove around Ooty with Alastair pointing out the sights including St Stephens Church, built by the British and still looking just like an English Parish church. It’s wooden beams were hauled by a team of elephants 120km from Sultan Tipus palace at Sriranapatnam, where we had stopped for tea just north of Mysore yesterday. 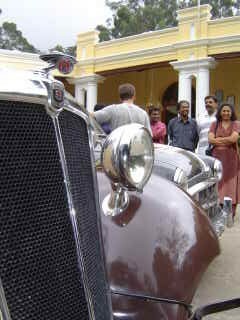 Alastair had kindly arranged for us to be invited for tea at the Ooty Club along with George, an Irish teacher at Hebron School who had been interested in visiting the historic institution for some time. 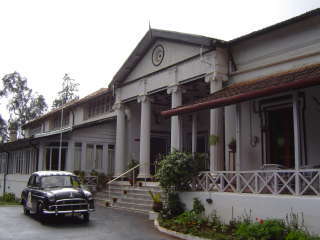 The wood-panelled rooms lined with hunting trophies and portraits of Queen Victoria and Sir Winston Churchill; the dining room displaying portraits of Ooty Hunt Masters in traditional English hunting garb; and the billiards room where “snooker” was apparently invented make the Club feel as if one has stepped back a hundred years. A notice in the billiards room explains that Sir Neville Chamberlain shouted “snooker” (the word for a junior cadet at the Officers Academy at Woolwich) when, one rainy afternoon at the Club, he and the other players developed a variation of snooker. Due to the rules of the school that must take account of the ethics of parents from a variety of cultures, some of whom do not approve of dance and drama, relationships between pupils, alcohol or smoking, we stayed in different houses: Tim stayed with Alastair and Ross and Joanne stayed with Eric and his wife who are the house-parents of the “Sunshine Dorm”. We made a presentation to the 7-9 year old girls in the Sunshine Dorm on Sunday evening just before bedtime prayers. The pupils at this morning’s school assembly did not seem to mind that, because of our presentation, lessons began a little later than usual, though the teachers might not have been so happy. The younger children were most intrigued as they gathered excitedly around Florence, holding our hands and asking us questions all at once. We enjoyed talking to the children but they had to go off for their mid-morning milk and biscuits and we had to be interviewed by “The Hindu” newspaper local correspondent and then Nilgiri TV both of which gave us an opportunity to thank Hebron School for the fabulous hospitality the staff and pupils had shown us over the weekend. Unfortunately, a tired Mum taking her children home from school in her 4x4 accidentally crunched the rear wing of Florence smashing the light lens. She was very apologetic but, sadly, this is one spare part that we are unable to find a replacement for in India so Tim spent some time this morning patiently trying to glue the bits together. We hope to get another sent out from the UK. A short drive from Ooty is Wellington, now an Indian Army Officers Staff College, where Donald, a British Squadron Leader attending the Staff College, whose children attend Hebron School, had invited us for lunch. It was pouring with rain when we arrived so we skipped the tour of the camp and instead went straight for lunch with Donald, his wife Kirsty, and their friends Johnnie, Karen and Mel. We were sorry to leave so soon as we really enjoyed chatting with people who were so much like us and hearing about their experiences of living in India for the last four months. Johnnie and Mel’s husband, Fabian, are also on the staff course with Donald for eleven months in total. We felt that driving straight to Cochin from Ooty would have been too far so Tom, a teacher at Hebron, called his cousin in Coimbatore who had seen us on TV and was pleased to have the opportunity to invite us to stay with her family en route. Liz and Bobbie live in an apartment and made us very welcome, introducing us their neighbours, Jack and Rachel, who in turn introduced us to Jose and other friends and relatives in Kerala. Liz, with whose family we had stayed last night, took Tim to a local garage before heading off to work. The garage manager is a friend of Liz’s and apparently helped support the London-Sydney Rally this year when they drove a circuit from Cochin up into the mountains and back, the way we had driven down from Ooty. Sadly they were not able to find a new light lens for Florence to replace the one broken a couple of days ago but Tim was taken on a motorbike to a shop that supplied us with a small hydraulic jack and brake pads that can be cut to fit. We are struggling to find the right brake pads so Tim thought it best to buy some that can be cut and holes made to fasten them in place. We had a quick lunch, more of what we had eaten for breakfast: sambar (spiced vegetable and lentil stew) with fresh dosas (pancakes made with coconut milk, rice flour and yeast) plus fried eggs, then started off for Kerala. As we drove from Coimbatore southwest into Kerala towards Kochi (was Cochin) and looked back at the mountains from which we had descended yesterday it became distinctly more tropical than any region through which we have travelled so far. 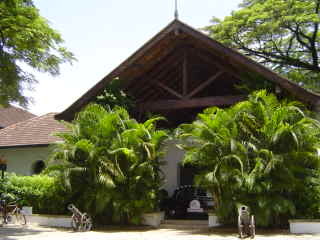 Tiled roofed bungalows nestled under coconut palms next to wet areas covered with water lilies and banana plantations. 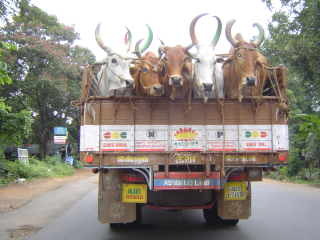 As well as the usual hooting lorries, buses, motorbikes and auto rickshaws, we dodged three-wheeler trucks piled high with bananas, working elephants and a truck full of buffalo on the national highway. 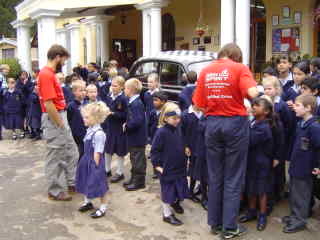 We also noticed many more Ambassadors than we had seen before; apparently they are still very popular in Kerala. Around Trichur tall chimneys of brickworks poked out above the palm trees. 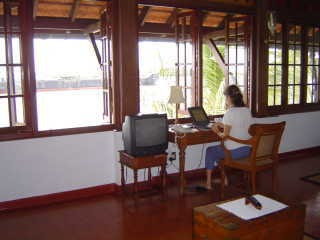 A friend of someone we met in Mumbai had booked us in to stay at the Cochin Yacht Club. (Cochin, like many places in India now has a local language name, Kochi, but everyone we have met says Cochin and the Club is CYC so here we will stick with Cochin to save confusion). Thinking it would be an old institution, like all of the other clubs we have stayed in, we drove over to the old area of Cochin and were directed by several people to a traditional one-storey building in it’s own gardens on the waterfront in Fort Cochin. We had arrived at Cochin Club, we discovered, not Cochin Yacht Club. The Cochin Club is apparently one of the oldest in India, founded, even though Cochin was a Portuguese colony, by the British. One of, if not the, longest residing Briton in India still lives at the Club: we had arrived outside of the visiting hours marked on a brass plaque on Mr Lawrence-Bandey OBE’s door so we left our card in the hope that he might be happy to talk to us for a few moments. A couple of lady members, who happened to arrive at the same time as us, offered to book us in to stay if we wanted but, after some deliberation, we decided that we should stick with the original reservation at the CYC as we were expected there. Instead, we joined Rose and Smitha for a lime soda on the lawn while they gave us directions to the CYC. 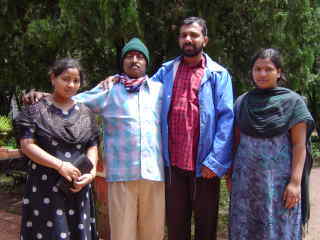 We were surprised to find that Rose and Smitha know Joe and Ramesh, both of who had invited us to the CYC, and all of the other people we have been introduced to or know of in Kerala, Ooty and Mumbai even. It seems that the social circle, particularly revolving around the Christian and Club networks in southern India, are fairly small. The sun was setting and illuminating the quiet historic buildings a beautiful pink as we took our leave and drove back again over two bridges to the main land modern part of town. Though sad to leave the old part of Cochin and rather doubtful about where we were going, when we finally arrived at about 7.30pm we were pleased to find that the CYC is a friendly place that is slightly more relaxed than some of the other clubs. There does not appear to be a dress-code (though we might yet be caught out) and several people, including the Secretary and his son, said hello to us as we ate our supper. The “mixed lentil dhal” was all yellow lentils so was a bit bland but the tandoori chicken and butter na’an were very good. The Cochin Yacht Club might not have history but it does have a superb, crystal clear swimming pool, outside next to the bar on the first floor so level with the tops of the palm trees. We had the pool to ourselves in this morning’s sunshine. It rained later and gradually clouded in by mid-afternoon but we preferred it to heat. After the refreshingly cool climate at Ooty it is likely to get hotter as we continue south and then east up to Chennai (Madras on old maps). There are only about five guestrooms and we appear to be the only resident guests in the Annexe, a house with two flats, one up and one downstairs, a couple of hundred metres from the Club. Our bedroom is one of two downstairs with it’s own shower room but sharing a sitting room (plus kitchen and servants room where one of the staff lives) with the other bedroom. Many of the members live in houses surrounding the Club in this quiet residential complex. Vinci who works for JCB and is a friend of Amar (a boat builder we had met in Mumbai) lives close to the Club and came to see us this morning to explain that he has arranged for us to make presentations to two Rotary Clubs near here tomorrow evening. Alistair, the Principal of Hebron School, had introduced us to the family who live opposite the annexe, so we called to see them once Vinci had left. Though we value the independence that having our own place offers, had they restated their offer of accommodation they had mentioned to Alistair we would have been very tempted to accept. They are friendly people, who also know everyone we have been introduced to here, and have a fabulous home. Mr Thakeran is an architect and spent several years building the house, which overlooks the wide expanse of palm-fringed river, in traditional style outside but incorporating traditional air and light principles into a modern open design inside. Most of the furniture and accessories are antique. It was really good to be able to see the beautiful house and, on a practical note, we were very pleased to accept Mrs Thakerans offer of her maid doing some laundry for us! We ate lunch at the back of the club again, looking over the river and watching the fishermen in their narrow wooden boats paddle along. We could be proven wrong but the Club appears to be a “yacht club” with no actual yachts or moorings for them, though some of the members do have boats and a couple are on the slipway. It does have badminton and squash courts and a swimming pool, though - more sports than the Sports Club we stayed in a few days ago! 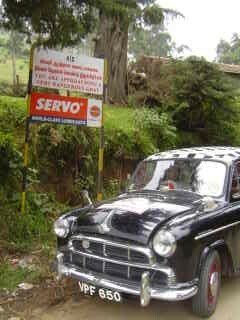 Tim took Florence to the local Hindustan Motors garage, GEO Motors, where he spent most of the afternoon completing paperwork and a little time supervising a mechanic replacing one of the window channels. He returned to the Club at 7.40pm, and has agreed to return to the garage tomorrow morning. It would have been a half hour drive to anywhere to eat so we decided to eat at the Club and were disappointed to find that the menu had not changed to anything more inspiring than it had been yesterday, still, it was good value and convenient. Even Tim calling the manager and threatening to speak to the press and local Rotarians about the two-hour delay in sending a driver to collect him did not provoke much action on the part of GEO Garage. It had been agreed yesterday evening that a driver would collect Tim from the Club at 9.30 to take him to the garage so that the work on Florence could be complete by lunchtime. Eventually, at 11.45am after many calls, a driver arrived who took Tim to the garage where Florence was greased. Tim refused to let then do anything else but put the door back together that they had begun working on yesterday – they were far too slow. Tim even had to stop the manager fiddling with the trafficators lest he break them! There is still some work we need to have done to the car but hopefully we will find other places to do that – nothing is urgent yet. We spent a little time this afternoon visiting some of old Cochin – a fascinating place quiet place with living historical influences from the Portuguese, Dutch, Syrian Christians, Jews, Chinese, Arabs and English yet it is still India. It has been an important trading post as far back as the Pharaonic and Roman civilisations that used to buy spices and pepper, in particular, from Kerala. After a good lunch in a chilled out trendy art gallery that is popular with the local smart set we were persuaded to have a go at helping lift up one of the Chinese fishing nets along the sea-front. They are huge cantilevered wooden frames with nets hung across the bottom that are lowered into the sea then lifted up by four or five men each. They caught only small fish when we were there but as it is a technique that has continued here since its introduction by traders from the court of Kublai Khan they must have more success at other times. We then visited Mattancherry Palace, a Portuguese Palace presented to the Raj of Cochin. It was renovated by the Dutch in 1663 and is therefore also known as the Dutch Palace. The walls of the wooden ceiling-rooms surrounding the open courtyard are covered in murals depicting various scenes from Hindu texts, apparently some of the best examples in India. Tim was particularly interested in the ones in the ladies bedchamber that show Hindu god Kirshna entertaining milkmaids with his eight hands while other people were “making merry” around about! The oldest synagogue in India was built in the grounds of the Palace in 1568, destroyed by the Portuguese in 1662 and rebuilt two years later by the Dutch. The ancestors of todays Cochin Jews fled Roman persecution in Palestine two thousand years ago and settled on the Malabar Coast. It is now a small community with no rabbi but there is still an area know as “Jewtown” where many spice and pepper traders are based. They were very enthusiastic and amused by our adventure; the lively questioning continued over tea and sandwiches before we all went downstairs for yet more photos, this time with Florence. Jack, a neighbour of Liz and Bobbie with whom we had stayed in Coimbatore (Liz is a cousin of Tom who works at Hebron School, see 6th September), told us that his friend, Jose Dominic wanted to meet us. 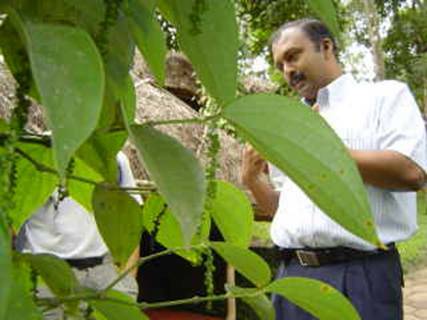 Jose is based in Cochin and is the Managing Director of a group of hotels in Kerala. As almost everyone we have met seems to know everyone else here, a few people had told us that Jose was the man who would be able to help us arrange a trip in the backwaters of Kerala. We met Jose at the Casino Hotel on Willingdon Island, the island in between the mainland modern city and the furthest spit of land where the old area of Cochin is, reclaimed when the port was dredged. Over breakfast Jose explained how the group, CGH Earth, had developed from owning the Casino Hotel to a group of four hotels (plus a house boat) aiming at the independent-minded traveller who is seeking an “experience” holiday. Each hotel, therefore, is an experience relevant to it’s location and all work as far as commercially possible to be “eco-sensitive” and to educate their guests about history, environment, food, culture in a luxurious environment but one that does not have the impersonality of many five star hotel chains. The brochure looked good, with recommendations from Conde Naste Traveller, Good Housekeeping and guests including Paul McCartney and Heather Mills, and we were very pleased to be offered the opportunity to test out the experience of each of the hotels for ourselves. Jose quickly organised a five-day itinerary for us as VIP Complimentary guests and we willingly accepted a slight detour from our intended route directly south along the coast to Trivandrum. Instead of leaving Cochin today we checked out of the CYC (very grateful for the generous hospitality of Joe who, unfortunately, we did not meet as he went to Coimbatore the day we left there for Cochin) then checked in at Brunton Boatyard in Fort Cochin. We were met at reception with wet flannels for our faces, garlands of jasmine were placed around our necks, our luggage was whisked away to our room and we were served fresh lime sodas as the Manager, Erine Louis told us about the hotel. We did feel like VIP’s though this does appear to be the standard greeting and was very impressive. 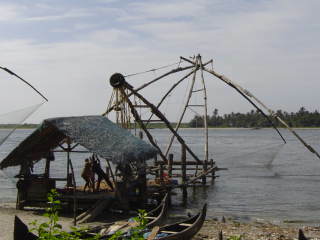 At the tip of Fort Cochin Brunton Boatyard was set up over a century ago by George Brunton and became a successful shipbuilding yard as well as export business. As the British shipbuilding industry dragged business back from Indian shipyards the Brunton Boatyard went into decline. The buildings were renovated and new ones built seven years ago converting the Boatyard into a unique hotel in a fabulous location. Sitting at the desk in our room it was hard to concentrate on working when the view over the delta, the mouth of the harbour from the Arabian sea, was so animated: the ferries to the mainland and Vypeen Island opposite; the narrow dug-outs paddled by one or two fishermen; tankers; Chinese fishing nets being lifted up opposite; dolphins in the distance and the rain sweeping across the sea. Our suite had a sitting room, bedroom with a huge four-poster bed so high we had little footstools either side to step up, kitchen, bathroom with large shower cubicle and bathtub with central taps and louvered windows to the side and a second loo. Though newly built it has a beautiful old gracious feel with even the smallest details in-keeping: old black light switches, polished antique furniture with white crochet-edged cloths on top, a collection of plates on the wall. Most items were salvaged from old buildings, for example, the ceiling fans were collected from homes in exchange for new fans and then renovated, other items were bought from warehouses of architectural salvage in Cochin. We were so impressed with our suite that we invited the journalist from the local edition of “The Hindu” up to interview us in the hope that she will mention the hotel in the article. 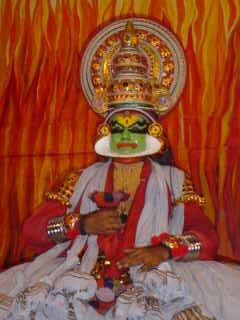 Even though Tim is not a fan of dance Joanne was keen that he experience Kathakali: a renowned traditional Keralan stage-dance-drama. The heavily made-up and ornately dressed male dancers use dramatic facial, hand and eye gestures to tell stories. 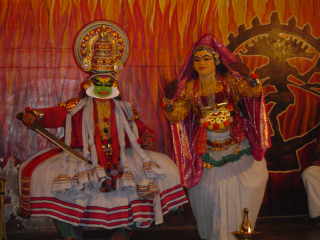 Performances would traditionally take place in temples and last all night but we saw a short demonstration of make-up, movements and story telling at the Cochin Cultural Centre near to the hotel. We returned to “The History Restaurant” at the hotel for dinner. Designed to offer a selection of foods incorporating the many influences on Cochin cuisine the menu is varied and interesting, even offering a short history on each page to set the scene. Here is the first time on our journey that we have eaten “hoppers” with a coconut chicken dish – an influence from Ceylon traders. (a hopper is served instead of rice and resembles a string dish cloth, but tastes much better! Tamara might remember Joanne being taught to make them many years ago on a visit to Colombo). The food and service were excellent and the amiable chef took a personal interest in helping guests make their choice from the menu. Thirty short lengths of the pool looking over the sea then a breakfast that more than made up for some of the disappointing breakfasts we have had lately – fresh frothy mosambi juice (known as fresh lime juice), plates of fresh fruit (banana which even Tim ate - Tim’s family take note! Plus papaya, pineapple and pomegranate), appam (rice pancake cooked with tomato, onion and green chilli) with sambar (dhal with tomatoes and other vegetables) and coconut chutney, toast, tea and more juice. The waiter pointed out that we were in “The Hindu” newspaper – not the interview we had given to the Keralan journalist last night but the article about our visit to Ooty following the interview almost a week ago. It had appeared in the Coimbatore edition as we expected and is today on the back page of the Kerala and Madurai editions, perhaps all Southern India editions. By ten o’clock we had received one phone call and four e-mails from well-wishers prompted by the report unflatteringly titled “In a jaunty jalopy”. One offered us t-shirts, another from a man who worked for a few years in Oxford offered us assistance from his tourism consultancy company, one congratulated us and said, “I was much impressed about your world tour, I appreciate your desire and adventure to ride and it should inspire the Indian people.” And another sent “hearty wishes for a successful tour”. We were surprised and flattered at the immediate and friendly response. Perhaps it is partly explicable by the fact that Kerala has the highest literacy rate in India and it is common to read the newspaper first thing in the morning. The readership of one of the local papers, “Malayala Manorama” is beaten only by the national Times of India and we are told that the employees in some workplaces still employ a person to read the days news to them as they work. Having skimmed the papers, collected a packed lunch and said thank you to the staff we dragged ourselves away from the Brunton Boatyard by about midday. Apparently five and a half hours was a good time for the drive to Thekkady despite having to get directions a few times on our way out of Cochin and a winding, occasionally potholed road up 900m to the “Cardoman Hills”. 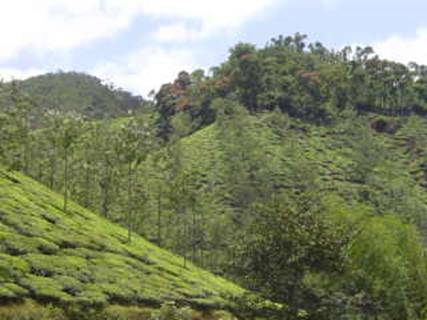 The route was interesting and took us from the coast, past rubber plantations up to tea plantations, cladding dramatic hillsides to forests and spice plantations on the higher plateaus. At one point we noticed that a red 1942 Russian jeep that had gone past us turned around overtook us then slowed in front of us as the driver hooted and arms stuck out of all four windows waved us down. When we stopped the four occupants of the jeep greeted us, one of the men excitedly telling the others how he had seen us in the newspaper, another had seen us in “Autocar”. Once they had shaken our hands no one quite knew what to do next so we said a bit about our journey, admired their car then waved goodbye. On arrival at “The Spice Village” in the centre of Thekkady we were greeted with masala tea, given an explanation of the activities on offer and shown to our room – a bungalow with sitting room, shower room and bedroom with veranda sheltered by an overhanging roof of thickly matted elephant grass held together with bamboo. Despite the many natural methods of pest control we still had a few mosquitos let in when the door opened. As we spoke to the manager, Anil Kumar, we drank glasses of “healthy water” – water boiled with different spices with therapeutic benefits, apparently. The buffet dinner was interesting and enjoyable – the difficulty was deciding what not to eat out of the tempting array of dishes on offer. Joanne trimmed Tims beard and moustache as it had really got to look like a “70s geography teacher” as Richard Monk said and there is no chance of a stop at a barber in the near future. Took an hour, saved us all of 15Rs but is a great improvement. The 7am yoga session was a little tame but was a reasonable stretch at the start of the day. After breakfast we and three other guests went with a naturist from the hotel to join masses of other people on a boat trip around the lake in the Periyar Nature Reserve. The lake is actually a reservoir that was formed when the British built a damn in 1895 and the dead trees still stand in the water. 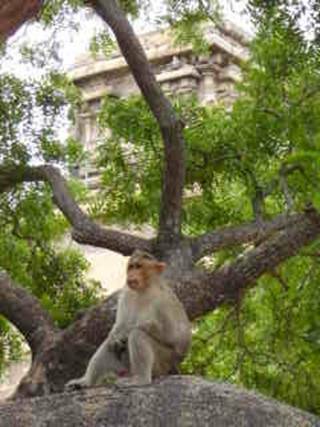 Then the area was a Game Reserve but now the largest nature reserve in India it is a protected area with a population of elephants, wild boar, snake-birds, sambar deer, sloth bears and 40-45 tigers amongst other wildlife. We saw a snake-bird (they swim beneath the surface with their long necks sticking out resembling snakes), wild boar, deer and an elephant from the boat. The Hotel Manager, Anil, Kumar, took us on an interesting and informative tour of the garden before lunch and explained in impressive detail the historical, medicinal, culinary and cultural significance of the wide variety of plants growing there. We learnt a huge amount in a couple of hours not only about plants but about what they show us about trade and the movements of peoples and cultures at least as far back as the Roman era. It was fascinating and much more illuminating than reading a book. 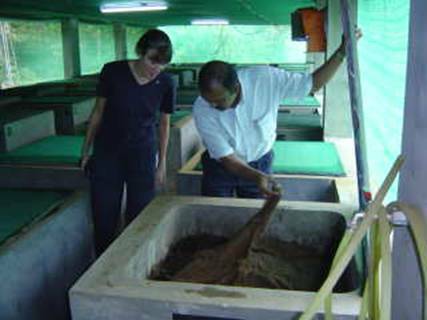 He also showed us around the composting area where all hotel food waste is converted into fertilizer to use in the organic garden and explained how the wastewater from the hotel is recycled into water five times purer than tap water. The peppercorns growing on most of the trees around the cottages is harvested and sold to Europe and many of the fruits and vegetables used in the hotel kitchens are grown organically in the gardens. As we walked down to lunch we saw huge bats, flying foxes, circling over the treetops and kingfishers darting over the pond. In the evening we ate grilled food sitting outside by a fire and learnt about how the hotel has worked since it was first established to help the local community destroy the poor reputation that had been generated by the influx of travellers several decades ago keen to find themselves by smoking dope grown nearby. The situation has now changed and other smart hotels are established in the area. 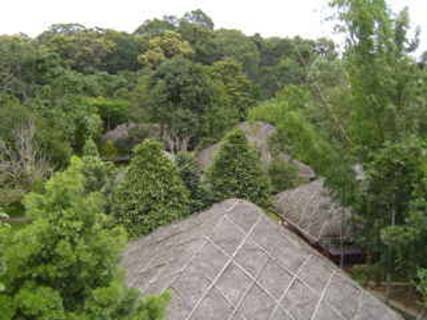 The Spice Village has developed over a few years and is sensitive to the needs of the local community, including the tribes people who were moved to the edge of the park when it was created. The hotel trades with and employs the expertise of tribal people as guides. It employs only local staff to work in the hotel and because of the poor image that local girls used to have the girls only work during the daytime, not in the evening, and are accommodated at a convent nearby. The money they earn used to be paid to their parents and saved as a dowry, now they save it to buy jewellery for their marriages. We went for a quick walk around the area so ate breakfast quite late, about 9.20am, intending to leave Spice Village as soon as we were ready. We wanted to check our e-mails before we left and, unfortunately, many of the 46 incoming e-mails were viruses with attachments that took ages to download and delete. When we accessed the Internet this evening we deleted any e-mails that looked like viruses from web mail before downloading. We do have up to date McAfee anti-virus software but it does not stop us receiving e-mails and it is such a waste of time. After photos with the hotel management and staff we left at midday and ate our chicken sandwiches, bananas, biscuits and tea as we wound back down through tea then rubber plantations towards the coast. We were surprised to see in several places hammer and sickle symbols - apparently the Communist Party and the Congress Party are the two most popular parties in Kerala. From Kottayam we drove a few kilometres on a narrow road past rice paddy fields and villages to a small compound where we parked Florence and climbed aboard a boat to take us to our hotel. One of the drivers of the Ambassador taxis in the car park had seen us in the paper and assured us that Florence would be well guarded through the night as all the drivers and a guardian sleep in the hut next to the cars. A ten minute boat ride along a waterway past people washing on the steps outside small houses surrounded by palm trees brought us to the Coconut Lagoon hotel on the edge of the largest lake in Kerala, Lake Vembanad. We were greeted by the manager and, most appropriately, offered fresh coconuts to drink as we completed the registration formalities. According to the manager two local TV crews had recently left the hotel and were near the boat jetty where we left Florence so (at 5pm) within 45 minutes of arriving we had amended our press release and were on the boat back to the car park to drive along the road and be interviewed. They seemed very interested but did not speak much English nor do we speak the local language so we said what we wanted to say about our trip and the hotels hosting us. It will be interesting to see the news broadcasts! On the short journey back we saw a flock of snake birds fly overhead and a large kingfisher flying along the bank then watched the stunning sunset over the lake as small boats drifted past. The hotel has a superb location and works well with the local environment. As with the other hotels in the CGH Earth group this hotel attempts to create “an experience” and to be “eco-sensitive”. 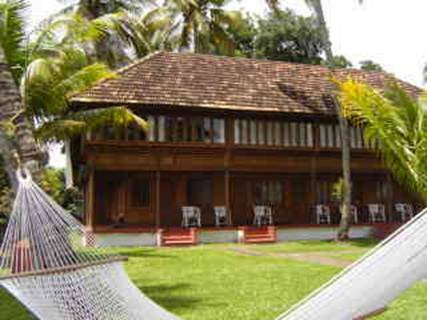 The buildings are mostly “tharawades”, traditional wooden Keralan houses, some dating back to the early 18th century, which were dismantled then reassembled on site. Our room is at the end of what was originally a two-storey wooden mansion with terracotta tiled floor and galleried bedroom and windows looking across the gardens on one side and the lake on the other. As traditionally people bathe in the waterways, as we witnessed from the boat tonight, our bathroom is outside – though rather more private! Through the back door to our room is a small courtyard open to the sky with basin, loo and shower around a small garden with a palm tree, banana tree and other plants. 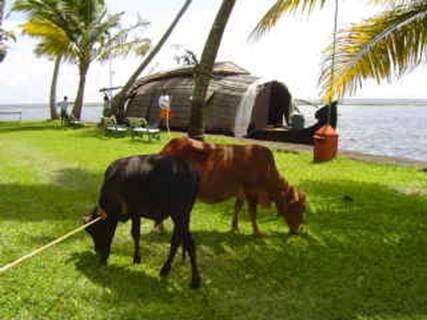 Rare orchids are grown in coconut shells fastened to the trees, fish live in the waterways in the gardens and the grass is kept neat by a herd of small cows from a rare breed. We ate dinner with Don Brooks, an Australian we met at Spice Village who is on a short holiday staying at four of the hotels in the group. 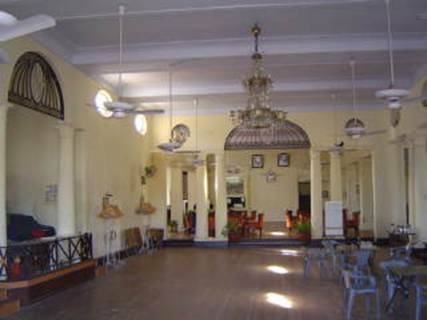 The dining room, like the reception building, is in what was originally built as a Brahmin house (home of a Hindu priest) and has brass oil lamps hanging in the central open space, faithful to its history. Joanne received the exciting news in a phone call tonight from her Mum (and text from Tim’s Mum) that her sister has just given birth to her first child, and their parents’ first grandchild, a son, Hugo James Fifield. Only two days after Tim’s sister gave birth to her fourth child and first granddaughter to Tim’s parents who have nine grandsons. Well done Louise and Sarah, great news! We are both much looking forward to meeting our new niece and nephew and accept that we will have lots of baby-sitting to catch up on when we return to England! We spent this afternoon and overnight on a traditional boat cruising across the lake and around the backwaters with Spice Coast Cruises. A relaxing afternoon as the only guests on a luxury houseboat made a fabulous change from dodging cows and trucks on the roads. Our last stop in a fabulous short tour of Kerala hosted by the CGH Earth group of hotels. It was raining as we swam in the large pool before breakfast but the sun had come out by 2pm when we left Marari Beach, unfortunately later than planned. Joanne’s tenants have just given notice that they will be vacating her London flat in October so we spent some time making arrangements to appoint a letting agent. Following the Autocar India article on our journey and regional press coverage we have received several e-mails from people to wish us well, tell us about their cars or invite us to meet them. 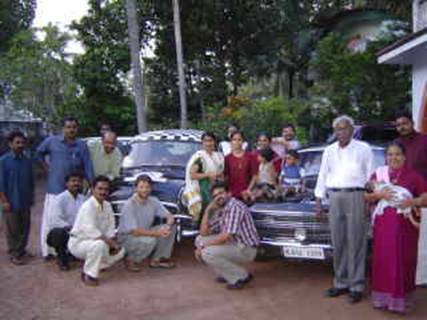 If we accepted them all we would need to spend several months in India, but as Reema and Salim live very close to the National Highway 47 along which we were driving south towards Trivandrum we were pleased to accept their hospitality. We were met at their garage, ‘Gulnar Car Care’, by staff offering fresh coconuts to drink along with a photographer from the local paper and a friend with a video camera to record the visit. They had offered a full service but Florence has been serviced recently so they checked the alignment of the wheels, gave us some engine oil and replaced a blown indicator bulb before taking us back to their house for tea where we met several friends, neighbours and relatives. We stole ourselves away from the Keralan hospitality of ‘Gulnar Car Care’ and headed off to The Sivananda Yoga Ashram inland from Trivandrum. We had brief directions – “Trivandrum then Kattakkada then Neyyar Dam, pay toll and turn left”. 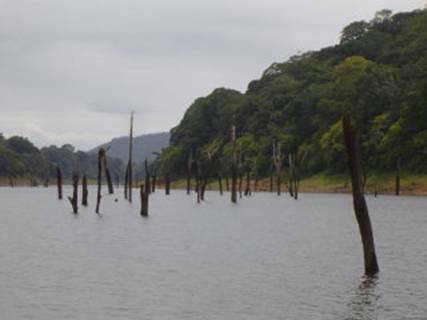 However, Trivandrum is a reasonably large town, there are no signs to Kattakkada and nothing to differentiate it from the other villages through which the road wound, and Neyyar Dam is signposted at very few junctions we had to stop and ask frequently. As usual, people were reluctant to admit that they did not know or could not explain so there were many “straight straight” instructions or “go straight then ask”. At one unsigned junction we took a right fork when we should have taken the left so stopped outside the Technical Centre to ask three smart young men where to go. One of them, Aditya Sharma, surprised his colleagues when he realised immediately that we were the people whose website he had been reading, “you’re Oxford2Oxford!” he said ecstatically, shook our hands a few times then excitedly told the others about us and asked for our autographs. It was fun to meet Aditya and being treated as if we were famous certainly cheered up our difficult night time journey. On one occasion we were told that the people near the Neyyar Dam are not friendly so it is dangerous and we should stay in town then go tomorrow morning. The roads were windy and a little rough but everyone we asked confirmed our route politely and there was nothing to suggest that we were in danger at any point. We finally arrived at the Sivananda Yoga Ashram at about 8.30pm with just enough time to check in, get some veg curry and dosas from the kitchen for dinner, make our beds and put up the mosquito net before we went to bed. Florence is parked under a tree at the centre of the ashram; there is no car park as visitors do not usually drive here. We have both practised yoga for several years and have attended Sivananda classes in the UK but they usually involve and hour and a half after work once a week. Not only do we practise the “asanas” (postures and breathing) for an hour and a half twice a day here, but we are woken at 5.20 when we are expected to wash (“everything”, Tim was told) before joining the staff and other guests at 6am for an hour and a half of meditation and chanting. 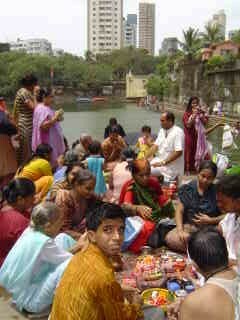 We were rewarded with prasad, a symbolic offering which today was a couple of sweetened crunchy banana chunks each. We could have eaten a lot more because the first meal, brunch, is not served until 10am after a cup of tea and an hour and a half of yoga asanas. The other meal of the day, dinner, is served at 6pm also in the main hall and, as with brunch, we all sit in rows on rush mats on the floor where we silently eat a plate of mild vegetarian Indian food, with our fingers. We are told that we eat sitting on the floor and with the fingers because we are in south India and that is how local people eat, we found that eating in this way, because we are not used to it, made eating unnecessarily difficult and less enjoyable. Apparently, eating in silence enables us to live for the moment and focus on the food. 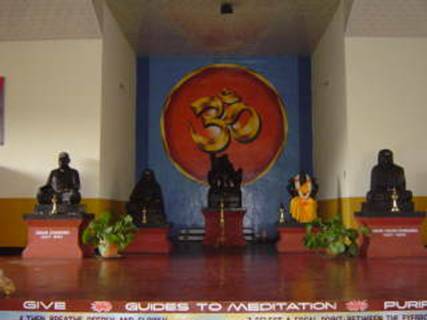 The ashram rules state that talking wastes energy so silence throughout the ashram is encouraged. We are also obliged to attend a lecture at midday and a final session of meditating and chanting for two hours at the end of the day. Joanne had a migraine that the afternoon session of asanas had failed to cure so she missed the evening session; Tim found sitting crossed legged and focusing on a flame for forty-five minutes challenging. Joanne also missed her session of “karma yoga” for today: each day small tasks such as emptying bins, cleaning shared areas or serving food are allocated to everyone, the idea is that these tasks are to be undertaken with the correct attitude of mind, that is without complaint and without the need for reward or thanks. 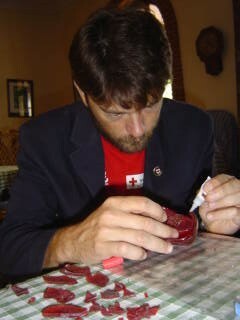 Tim’s “karma yoga”, or selfless service, for the day was to help with serving the evening meal. The notice on the wall of the accommodation block states, among other rules, that food should not be kept in the rooms; this is for good reason as Joanne learnt this morning when she lifted a box containing a banana out of the basket and a couple of big bugs, the size of cockroaches, scuttled out. There seem to be a lot of bugs here: a big fat spider (about 2 inches diameter) ran between us as we sat silently in this morning’s meditation session (we should have been concentrating with our eyes shut then we would not have noticed) and mosquitoes bite throughout the day. We dodged mossies as we did our “karma yoga” for today - cleaning up the hall after the evening meal with very little light. As everyone sits on rush mats on the painted concrete floor and washes up their own plates and cups cleaning up is relatively easy, no chairs and tables to move, just rolling up of the mats, brushing up the bits then mopping. As we are not used to sitting on the floor for such long periods of time our knees, ankles and backs are a little sore but out yoga postures are better after some good coaching. After two weeks of this routine we would undoubtedly be stronger and more relaxed. We might have learnt how to meditate and we would certainly have learnt some of the chants that are sung at the end of each meditation session. As today is Saturday the meditation session was shorter and was followed by a “talent show”. By singing a song, reciting a poem or something similar members of the course are encouraged to open-up and share with the others. We were asked to speak about our journey and our short presentation, though we are not sure if it demonstrated any "talent", was received with interest. We began the day with a silent (meditative) walk as a group (led by Neema) to the Neyyar Dam where we sat at the edge of the reservoir and watched the sun rise above the jagged mountains reflected in the water. After only a couple of days of chants we sang along with only a few mumbled words despite not having the words in front of us. (On our first day at the Ashram we had struggled to just work out where in the book we were supposed to be!) It was a lovely way to start the day. We walked back past villagers washing in the reservoir as loudspeakers blurted out hymns disproportionately loudly for the size of the small church. Through the reservoir gardens (an unusual visitors attraction that we found rather odd: gaudily painted statues of animals and people including one using a pneumatic road drill) we could hear lions roaring in the sanctuary nearby until the Hindu chants being blurted out at the temple took over. After another yoga asana practice and lunch (we felt almost rebellious using spoons but it was much easier to eat the vegetables in coconut gravy and rice) we packed up, said our goodbyes and drove south for two hours to Kanyakamuri. Angelica, an Austrian girl attending the course for a few days, wanted to visit Kanyakamuri so decided to come with us, stay overnight then make her way back tomorrow to the Ashram. She has attended several courses at Sivananda ashrams in Austria and she patiently answered many dumb questions about yoga, Hinduism, Sanskrit etc that we had not had a chance to ask anyone while at the Sivananda Ashram or previously at classes in England. She greatly enhanced our understanding of yoga and was a perfect companion on our visit to the Hindu pilgrimage town of Kanyakumari and the most southerly tip of India. We had been advised to stay at the Vivekanandra Kendra (ashram) which was not only great value (150Rs - less than £2 - for a double room with fan private shower and squat loo) but friendly and interesting. 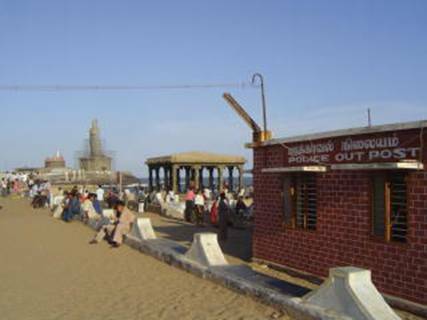 It was founded in memory of Swami Vivekanandra - an Indian philosopher and monk – with the intention of continuing his work but they are welcoming to visitors and helpfully give out information about the places to see and how to get to them. We joined masses of pilgrims on the short ferry over to a rocky island about four hundred metres off the shore where a temple has been built as a memorial to Swami Vivekenandra who meditated there for three days in 1892. There is also a shrine built around a footprint on the rock said to be where the Hindu goddess Parvati had stood on one leg trying to get Siva to marry her. The myth (please correct me if I am wrong) goes that he was distracted on route and never made it. They did marry in the next life though so all’s well that ends well! We walked past ice-cream sellers on bikes, horses taking people for rides on the beach, market stalls selling souvenirs, “café” stalls selling tea, coffee and banana and chilli fry, to the bathing ghats, a small beach area where people were watching women paddling and young men playing around in the sea. There was even a "police outpost" literally on the beach at the most southerly tip of India! 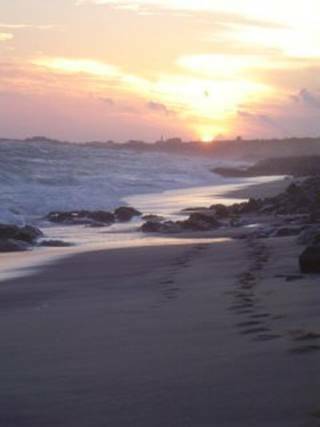 It is such a significant place that we wanted to go in to the sea but to avoid upsetting people we would have had to have been fully clothed and the idea of walking around wet as the sunset was not appealing. Instead we walked past the memorial to Ghandi and past the sunset and sunrise viewing tower to a stretch of beach that was almost deserted then splashed around in the waves until the mass of sunset viewers spreading along the beach reached us. We watched the sunset too then walked back to the ashram where we ate a great veg meal with dishes topped up whenever we wanted for 23Rs – the canteen is functional, the choice is between North or South Indian meals but the food and value for money were really good. Bed at 9.30pm, tired and needing sleep as we plan to get up to watch the sunrise tomorrow. Up at 5.30 again so that we and Angelica could see the sunrise over the most southerly tip of India, and take a picture of Florence there. It was not altogether successful because we could not reach the viewing place we had planned to but the sunrise was impressive and it was good to have something to make us get up early. We ate a great breakfast of masala dosa with tea and coffee for about 20Rs (superb value especially considering Tim ate idly as well!) then after taking Angelica to the bus stand in town we hit the road north. 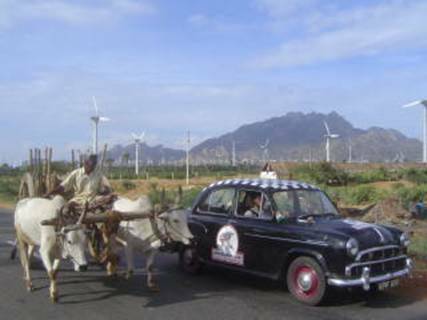 Initially through low plains of banana and coconut plantations bright green against the dark jagged rocky mountains in the background then past miles of open countryside sprouting hundreds of wind farms; dramatic in contrast to the ancient but still popular technology of ox-carts and charcoal-making at their feet. India uses more electricity than it can produce and there are regular power cuts, in fact in some rural areas power is switched off for some time each day, but the state of Tamil Nadu appears to be working to counter this as amidst the wind farms there was also a sign for a nuclear power plant. We called in to fill up at a Bharat Petroleum station, as we usually do in India, and were met by the Territory Manager who had seen us on TV – he was thrilled to meet us and we were very pleased to be given a free tank of petrol! On past the temple city of Madurai along a more rural winding but still good road that took us through small busy towns where we dodged white Ambassador cars, ox-carts, cows, cyclists and people with towering piles impossibly balanced on their heads as well as villages with stalls selling chai and snacks; through an area of rice-paddy fields where the village houses were mainly small huts made of mud with low overhanging palm leaf roofs, through a forest where monkeys sat at the side of the road and over wide river deltas. We stopped at a small roadside market to buy green coconuts (if you have not tried green coconut one drinks the isotonic liquid then scoops out the layer of white jellylike flesh to eat with the aid of a bit of husk – very good) and generated much amusement from the women at nearby stalls who encouraged the coconut seller to smile for our camera then giggled at each other as they also posed for photos and laughed at the digital images. A quick pit-stop for a thali, here called “variety rice “and served on a coconut leaf for 18Rs, then we pushed on past Trichy, also a temple town, to Pondicherry. We still had about an hour to go as it got dark and, worse still, heavy clouds loomed and lightning flashed intermittently in the direction in which we were headed. All of the obstacles that are challenging enough in daylight – overtaking trucks and buses forging their route regardless of who is in the way, static cows and slow moving ox-carts, dashing dogs, pothole dodging cyclists and motorbikes, tractors with wide farm implements, pedestrians, branches and rocks marking broken down trucks, recently crashed cars… - cannot be seen until the last moment. Few vehicles or people have lights and those that do tend to switch them on to blinding full beam at the last moment! It took determined concentration on both our parts to reach our destination unscathed. 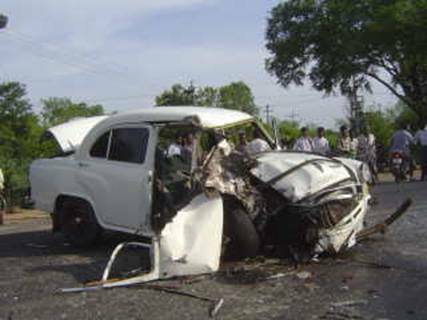 We passed the remains of at least three recent accidents today – an Ambassador smashed in the middle of the road, a crunched Fiat and worst of all two trucks with both drivers cabs totally crushed. The unwritten rule of the road is that the smaller vehicle gives way to the larger vehicle coming towards it even if that means going off the road. In this particular case it appeared that, as both trucks were the same size, neither had moved out of the way resulting in a fatal head-on. Given the lack of any road discipline it is surprising that we have not seen more accidents. We found the Hotel de l’Orient easily, a man who had seen us in the paper pulled up next to us at a junction, told us his grandfather had a Landmaster, congratulated us on our journey, and confirmed that we were going the right way. We did not have a booking but our luck was in because surprisingly at 8pm the manager, Anthony Gabriel Thomas, greeted us when we arrived. Tim explained what we are doing and said that we would be happy to do some publicity for the hotel in return for complimentary accommodation and, after a phone call to the head office of Neemrana Hotels www.neemranahotels.com we were shown some of the guest rooms and offered two nights in the superb “Mahe” suite. Despite Joanne’s concerns about driving in the dark it was worth the effort to get here in one day. We ate a late but lovely meal and slept very well in a huge four-poster bed! A mellow day spent in Pondicherry where we wandered around the calm wide streets admiring French 18th Century colonial buildings and visited the Sri Aurobindo Ashram exhibition. The old French area has wide quiet streets, the majority of people walking or cycling. Many street signs are still blue and white, like in France and the police wear red kepis. 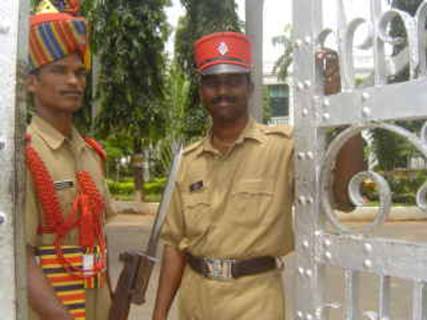 The guards at the gates to the Governors Residence were very smart in red kepis or colourful red, gold and blue turbans; despite Joanne’s compliments and small talk about cricket (very small, Joanne knows very little about cricket!) they would not open the gates further than a couple of feet. The Hotel de l’Orient organised a press conference for us at 6.30pm when we were interviewed by The Indian Express, Dima Malan, Dima Shanthi, Sky Sat TV, City TV, AMN TV, and Dina Mami. This was the first time we had sat at a table facing microphones and a bunch, in this case about twelve, of the media. The majority spoke only a little English so 2-3 journalists asked most of the questions, the others picking up the answers from each other and from the press release we had issued. We are going to meet reporters from The Hindu and News Pondicherry tomorrow. We were pleased to tell the reporters about our stay at the Hotel de l'Orient. The brochure says "Live History" as the hotels in the group are each unusual historic buildings. Collages of photos at reception show the building prior to restoration, barely recognisable as the beautiful building it is now. 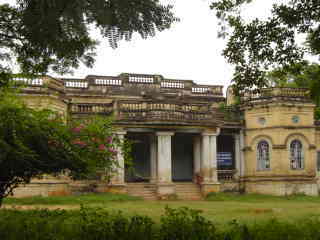 Originally a French 18th Century Mansion, the building had been used most recently as an Indian Government Educational Institute then abandoned before being purchased and restored by the current owners. The staff are justifiably proud of the place - in 2000 the Hotel de l’Orient was awarded a UNESCO Asia-Pacific Heritage Award as an outstanding project in Culture, Heritage and Conservation. Breakfast interview with the Pondicherry Features Editor of The Hindu during which Joanne asked almost as many questions about the journalist’s social life and her problems with wanting to marry someone two castes lower, as she did about us. Another interview over lunch, this time with a journalist from the weekly “News Pondicherry” – she had just called in to the Press Club where fellow members of the press had told her that she should try to interview us. The local TV company, City TV, that had asked if they could film us departing did not arrive so we left as soon as we were ready for Mahabalipuram (Mamallapuram). There are celebrations going on at the moment imvolving images of deities being thrown into the sea so it was busy as we drove along the seafront. Something must have been happening in town too as at least three policemen directed us off the main road through the city centre and off down a narrow side street with no further directions about where to go next! We managed to weave our way through the streets to a main road in the direction we wanted and discovered that we were on the ECR, the Eastern Coastal Route from Pondicherry to Chennai. Not marked on our map, the road was completed about two years ago and is by a long way the best road we have driven on since we arrived in India – not much traffic, no potholes, clear white line in the middle, yellow lines PLUS cats-eyes at the edges, legible signposts and even emergency phones, quite amazing! It still has ox-carts going the wrong direction and cows going in all directions but we were impressed. The Principal of Hebron School had generously arranged for us to stay at a guesthouse at the Christian Scripture Union Camp just outside Mamallapuram for two nights but, as our plans have changed and we now have a fixed date for leaving India, we have had to shorten our stay to tonight only. We were welcomed by Jacob and his wife Rani who took over the running of the guesthouse when he retired from the coastal service recently. Set up for those in Christian work to have restful break it is a small well-designed house with the few guestrooms opening onto a garden with hammocks and a treehouse. There is no direct sun into the rooms despite many large arched windows so it is relatively cool and relaxing with overhead fans and mossie nets over the beds. A walk of a few hundred metres through trees brought us to the long sandy beach, stretching as far as we could see North and a couple of kilometres South to Mahabalipuram. The sea did not look too rough but there are many reports of people drowning in this area because the undercurrents are strong and unpredictable and the seabed shelves quickly. We did not have long before breakfast anyway so we just had a splash around in the waves to wake us up. The sea was not as warm as we had experienced on the West coast but it was not cold. Breakfast at the guesthouse then we took a rickshaw tour, organised by Jacob, of the main sites in Mahabalipuram. 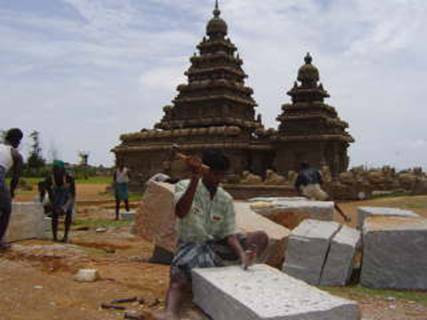 From the 5th to 8th Centuries the Pallava kings of the Kingdom of Kanchipuram used Mahabalipuram as their seaport and second capital. It’s famous 7th Century shore temple, the only one in India, has World Heritage Listing. It, like some of the other sites, is still being excavated and stonemasons are employed on site to chisel stones for renovation work. Either side of the piece of land it sits on is wide sandy beach, fishermen riding in on the waves in long narrow boats made of tree trunks lashed together. A barrier of piled rocks protects the small promontory. 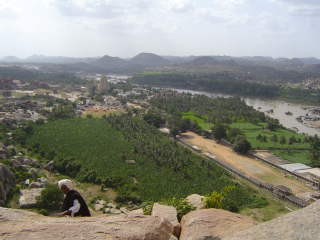 Reminiscent of the ancient, now ruined, city of Hampi (diary 30th August), the area is flat but for mounds of huge boulders. 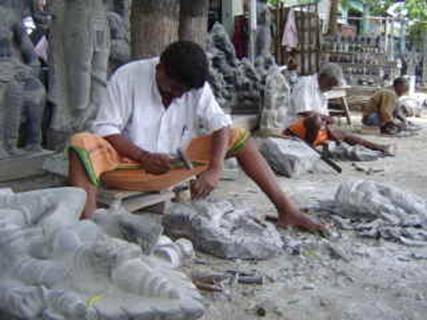 Since its heyday Mahabalipuram has been famous for its skilled stone sculptors, the streets are still lined with stonemasons workshops. All around the town these huge dominating rocks have been carved into mandapams (pillored pavilions) with temples cut cave-like into the rock behind. 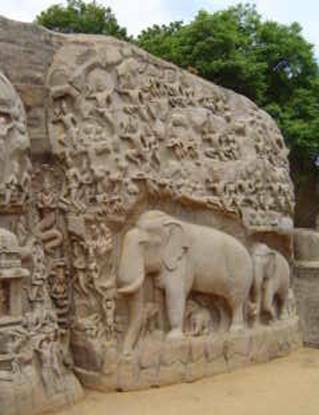 “Arjuna’s Penance” is an impressive relief carving on the face of a rock over 30m wide by 12m high depicting animals, deities and other semi divine creatures and fables from Hindu books. 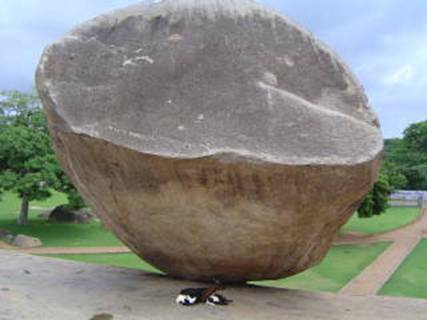 Legend has it that kings ordered teams of elephants to try to move a huge balancing boulder but none could budge Krishna's Butterball. The five “Rathas”, rock temples resembling chariots, were excavated from the sand by the British 200 years ago. The life-size elephant, representing the mount of the rain god, Indra, is regarded as one of the most perfectly sculptured elephants in India. It certainly looked amazingly life-like but had lost it’s tusks. Given its attraction as a tourist site it is not surprising that the small town seems to be populated by stonemasons and touts who pester constantly in an effort to act as guides, sell postcards, take you to their shops, sell trinkets or anything else they can think of to get money from tourists. Indians and foreigners are all pestered but as foreigners have probably got more money we are the main targets. Even the smartly dressed uniformed schoolchildren have picked up the patter, “which country you from? How you like India? 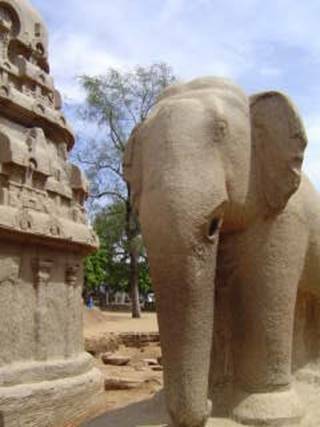 How you like Mahabalipuram? You give me rupees? School pen?…”. Having our own auto rickshaw driver for a couple of hours who waited for us at each site made sightseeing much easier as we had no need to haggle over prices, we had agreed a fixed price in advance. 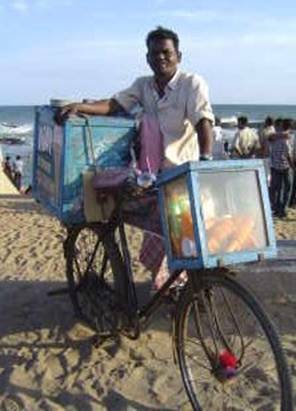 Shankar is a Tamil who has sought refuge in India from Sri Lanka where his parents live. He said he will go back in a few years when the situation there has improved. Shankar was very friendly and amused when we drove past him later on our way from Mahabalipuram to Chennai. North Indian biryani, dahl and na’an at a safari-themed roadside restaurant for lunch, unusual setting but the food was quite good, if a little spicy. We had been told to aim for the port when we got to Chennai but there were no useful signs and the only policeman in sight at a crucial junction sent us off in the wrong direction because of a road closure. His directions were so vague – “straight straight” accompanied with a wave behind him in the general direction of the sea, to be precise – that we ended up driving alongside the beach through a very poor part of town. Small coconut palm houses squashed together, boats pulled up on the beach, women queuing to collect water in coloured plastic pots, cows and goats rummaging through rubbish, public loo blocks…and the whole place smelled of fish. Back on the main beach road we asked directions again and again and eventually u-turned, found a main entrance to the port and called the office of the shipping agents that we were trying to find. One more u-turn and we pulled up in front of the offices of Chakiat Shipping Services (P) Ltd. Met at the door by Mr Murali we were shown straight into the office of the Marketing Manager, Mr Samir. Chakiat Shipping Services (P) Ltd are the agents dealing with the documentation and customs clearance procedures of arranging for Florence to travel in a container on a Regional Container Lines Feeder Pte Ltd ship from Chennai to Singapore. Not only are both companies providing their services free of charge but Regional Container Lines have agreed that we can travel on the container ship too! This really is fantastic news! 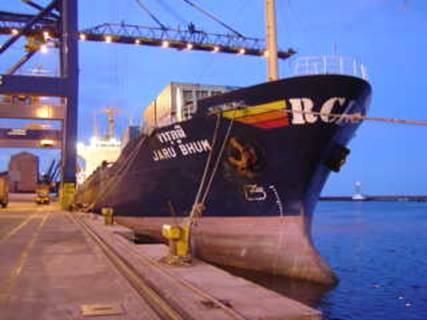 Passenger travel on cargo ships is very limited, especially since July 1st when new international security regulations came into force. Apparently RCL have not taken passengers before so many permissions have had to be sought in order for the arrangements to get this far. Samir showed us the fifteen or so e-mails he had just received concerning the arrangements for our journey. There is still much paperwork to complete to get Florence and us through customs and immigration and onto the ship and then there is the arrival to think about…but the team at Chakiat seem very willing and helpful so we are confident that if it is possible they and RCL will make it happen. It is worth briefly explaining how this came about because it is a good example of the incredibly supportive network that has received us so well in India. Amar, who we met at the Royal Bombay Yacht Club, introduced us to his friend and fellow “boat-builder”, Joe, who works in Cochin. Joe was in Coimbatore when we were in Cochin but he hosted our stay at the Cochin Yacht Club and introduced us to his friend, Winci, who works for JCB and arranged for us to speak at two Rotary Clubs in Cochin. Winci also introduced us to his friend, Apuu, in Cochin whose family run Chakiat Shipping Services. We have spoken on the phone and corresponded by e-mail but have sadly not met Apuu. Chakiat Shipping Services are the Chennai agents for Regional Container Lines, the Middle East Director of which, agreed to support us. Coincidentally, two other contacts in India, one the CEO of Safmarine in Mumbai, and one an administrative officer at Hebron School, Ooty, have both just e-mailed us to suggest that we speak to RCL/Chakiat. The drive out to the Hilton Trident Hotel near the airport was made more stressful by an idiotic driver who, in rush hour four lane traffic almost at a standstill, drove into the back of us. Fuming, we both jumped out and Tim immediately reached into his van, switched his engine off and took his ignition keys while Joanne told him what she thought of him and took his name, address and registration. It is doubtful that chasing him for the cost of damage would have been worthwhile so it is lucky that he actually did no damage. He continued to drive in the same wobbling stop start way nearly colliding with a motorbike so we steered clear from then on. Ran from Good Relations India (who are co-ordinating our PR in India) recommended for good value good food we try the restaurant above the Bharat Petroleum station near the hotel. It seemed an odd suggestion but was surprisingly good – looking down over a huge forecourt with 20 pumps, one man at each, with a fruit shop, pizza take-away, sweet shop, a general store and coffee shop to add interest – the restaurant (with an airline theme) served good vegetarian food at very good prices, with an unusual view. Staying at a modern five-star airport hotel feels as if we have finished our time out in India and are back to work. Though a very good hotel, newly refurbished with all the facilities a business traveller might need including a pool, gym, wifi internet access, DVD players in the Executive rooms and so on, it is not like much of the India that we have experienced over the last few weeks. It is a good base for us to prepare for the next leg of our journey. Pouring rain today so we didn’t mind having a day of admin. Quick swim this morning before breakfast then Tim took Florence to ACT India, the Hindustan Motors dealership nearby, for the last opportunity to have some work done on the car before we leave India. They fitted a new lock to the rear right door, repaired the internal fan we had had fitted in Mumbai, fitted a bulb and wiring to the temperature guage (so we can read it at night), cleaned the spark plugs and points, fitted a new channel to the rear left door (the others were done earlier in India), fitted a new frame to the drivers side quarter light (they had been sealed up by the previous owner so we had not opened them), and fitted new rubber seals to the windows. 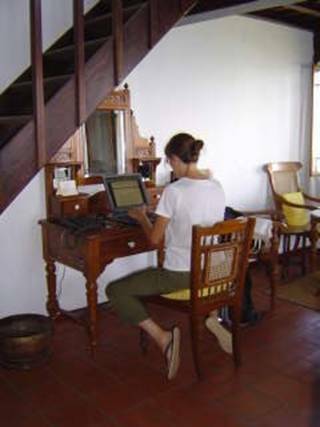 Joanne continued to make arrangements for the next leg of our journey and worked on the press release about our departure and unusual method of travel from Chennai. ACT India garage in Chennai, a Hindustan Motors dealership, hosted us again today. This time Joanne went along too and with both video and still cameras recording the work on Florence the staff were quite amused by our presence. The Manager Service, Mr S Murali, was very accommodating and invited us to base ourselves in his office where we were given sweet frothy coffee, biscuits, sodas and water throughout the day. We ate mini-executive-meals for lunch – a cardboard box each containing six small pots each with a different hot dish inside plus banana chips and chapatti. Unfortunately, the rear light lens that has been sent out from England has not arrived yet and a replacement has not been found here, though a couple of people are confident that they will find one. We would be very happy to carry a spare if one is found in addition to the one in the post. There are masses of Ambassadors here, almost all white because that is the colour of the cars of members of local and national Government, police, judges and other officials who still use the Hindustan Ambassador. Until the 1970’s it and the Fiat were the only cars on Indian roads, the market is now open so there are many different makes. Unlike modern cars that are fitted together out of several sections, the Ambassador has a one-piece body shell so that cars that are seriously crunched can be fitted with an “Ambassador Refreshing Kit” – everything less the suspension, wheels and engine. Some of the cars we have seen crashed on the road recently were probably even past being saved with one of these. Sunday and we felt as if we had a day off. There has been so much happening recently that it was a relief to think we had a whole day with no plans to stick to or people to meet. 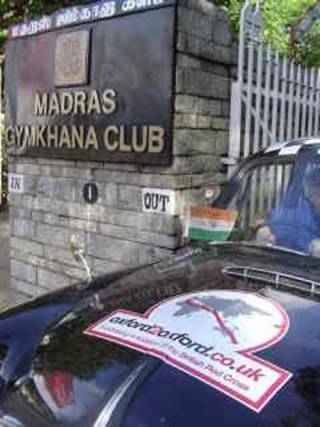 We thought we ought to check out two potential venues that had been suggested for us to meet with the press on Tuesday so after a swim and leisurely breakfast we drove to the Madras Gymkhana Club. The Lansdowne Club in London has reciprocal arrangements with the Club so we planned to do as many locals do on a Sunday and have lunch at a club. 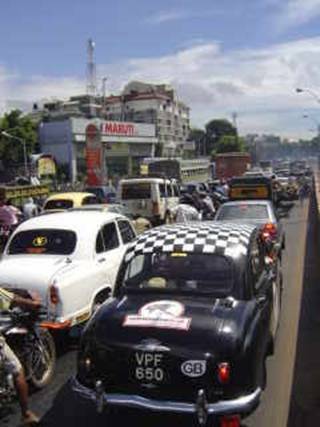 Driving down Mount Road (now also confusingly known as Anna Salai), a famously congested road, we found that there was only marginally less traffic than on a weekday. Even nighttime is “peak time”, we are told, that is peak time for trucks, whereas the morning and evening are peak time for commuters. Perhaps Sunday is peak time for people going out for lunch. Apparently, when Boris Becker visited Chennai he asked if he could be driven along Mount Road: choosing to soak up the hot, humid, fume-filled atmosphere seems potty, but, heh, each to their own; perhaps it is a little more bearable with air-con. We had little choice; it is the main road into the city from the hotel where we are staying in the suburb of Guindy. The traffic would not be so bad if people stayed in their lane but this is a concept that appears to be impossible for Indians to grasp; if there are two lanes marked on the road there will be at least three lanes of traffic, one squeezing down the middle of the other two lanes. There is no differentiation made between undertaking and overtaking because it is understood that one travels on whichever bit of road there is a space, even if that space is not quite big enough or is in front of the car to ones side because one can always push another vehicle over. This rule of the road is called “adjustment”: one does what one wants to do and assumes that other road users will “adjust”. This, of course, is only guaranteed to work if one is bigger than the vehicle that is required to adjust. Smaller always gives way to larger. Cars are of equal status so it is the most determined and the one who hoots their horn first that wins. Motobikes and scooters, of which there are many, follow no rules, they just hoot when moving forward in the belief that vehicles, pedestrians, other motorbikes and cyclists will move out of their way. Hooting of horns is essential because no-one looks anywhere but at the road in front of them; most wing mirrors, if they are fitted, are turned in. Though being an inch away from another vehicle is not a problem for Indian drivers who have different concepts of body and car space to us, we have seen too many accidents in Chennai to trust other road users judgement. Most accidents are only bumps in slow moving traffic but we do not need another. Only in Chennai has it been necessary for both of us to frequently verbally warn off other drivers, if there is not time for that or they are in air-con vehicles a whack with the hand or a plastic bottle on the side of the offending vehicle, or better still on the drivers window, has proven to be an effective way of fending off vehicles encroaching into our space. In fact, a “Paddington bear stare” and a growled “back off” occasionally even prompts an apology from drivers heading our way who, surprisingly, smile and keep their distance from then on. The road traffic police do little to enforce the rules of the road, such as they are, and generally stand at junctions waving the traffic on when the traffic lights turn green, or, as is often the case, when the traffic lights are red but the countdown shows that they will be green in twenty seconds or so and the traffic coming the other way has nearly come to a standstill. We saw a policeman being given money at one junction and were told some time later that policemen do stop road users who break the rules, however, it is understood that if one offers, say, 50Rs cash a ticket will not be issued. If not, an official fine of 500Rs will be issued, for example. This behaviour is perpetuated because it is a win:win situation – the policeman earns some additional cash and the driver knows he has done wrong but gets away without having to pay a huge fine. Of course, one could report the policeman for trying to take bribes but few believe that would change anything and, besides, one would still have to pay the fine and possibly also court fees for a case one would most likely loose. Most of the people of whom we asked directions to the Club responded with the usual “straight straight” but one man on a scooter said “follow me!” and whizzed off ahead of us. Arriving at the gates of the Club he introduced himself as Trevor, shook our hands, welcomed us to Madras and said that he had heard all about us at the British Business Association where he is the barman. It is a shame that the British Deputy High Commission had not put us in touch with the Association, as we would have happily made a presentation there. It is too late to arrange a meeting at this stage so we will not meet any of the British business people based here and they will not meet us. The British founded the Gymkhana Club at the beginning of the century and it still retains many of the original features including a grand ballroom with chandelier and beautiful art-deco style arches into the surrounding dining area. One can imagine (if one tries hard) a 1920’s dinner dance after a cricket match on the lawns. Sadly, with plastic garden chairs in the dining area and stacked outside open French doors, tables still full of lunch-time debris, a foul smell drifting in from the nearby canal, peeling paint and curtains barely fixed to the rails above the windows it’s former grandeur has more than faded. Crows appeared to be most at home balancing on the chandelier in the ballroom and, like the peeling paint, scruffy carpets and tarnished trophies, they were ignored. We ate lunch in the air-conditioned Buttery Bar, once we had found it amongst the confusion of rooms leading off the upstairs landing area. Our choice would have been to eat downstairs under ceiling fans next to doors open onto the lawn but the area was scruffy and crowded and, we were advised, short on staff. We had been advised to eat at the buffet but it was served in a small not too well air-conditioned upstairs room, crowded and with curtains closed and a haze of smoke from the kitchens or the burners keeping the food warm. 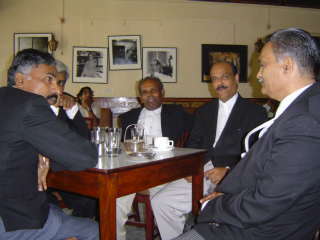 The Buttery Bar, like in other Clubs in India, was the “smart” dining room with plush curtains, air-con and waiter service. It was not expensive but the food was uninspiring and not hot and the waiter only expressed an interest in us when we left, asking for a tip that he did not deserve and did not, therefore, receive. Having decided that the Club was not to be the venue for our press conference we navigated our way through busy streets and past a procession that generated a confusion of traffic congestion to the Taj Coromandel hotel where it had been suggested that we could meet the press in the foyer. Intending to treat ourselves to afternoon tea in one of “The Leading Hotels of the World” we were disappointed to find that tea was served by a concession, Barista, and was nothing special. A potential option for meeting with the press but, as the press here expect coffee to be bought for them and not vice versa, spending the day here could be unexciting and pricey. Back to the hotel for a room service supper of chicken biryani, dahl, raita and butter na’an, which was excellent, if a little self-indulgent. Good Relations India in Chennai had invited the media to meet us at a press conference kindly hosted by RCL/Chakiat Shipping Agents today. The press release written by Joanne was issued at the conference and later with a photo to AFP who could not attend. The local Tamil TV company, Jaya TV, interviewed us as soon as we arrived. We spoke to the other journalists together though, as elsewhere, journalists from the Hindu and the City Express led the questioning. Others that attended included reporters from Dinamani, Mathrubhumi, Shipping Times and Newstoday. For some reason the reporter from The Week could not get to the office this morning so we met her at GRI office after we had posed for photos at the beach and had a pizza lunch with Samir at the Chakiat offices. RCL/Chakiat looked after us very well and we made an effort to get their names and those of our other sponsors into the press though one can never guarantee that the press will publish sponsors names. Chennai is apparently famous for it’s beach, second only to a Florida beach in it’s length, hence the request for us to pose for photos there. 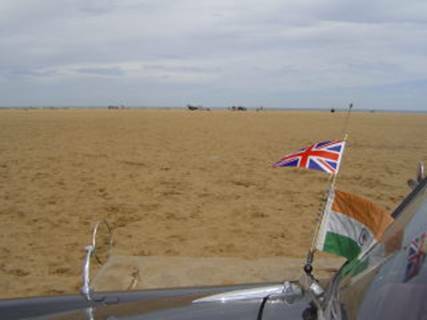 As we drove along the beach road we passed children who had set up stumps and were playing cricket along the tarmac, not on the vast swathe of bare flat sand as we would have expected. We ate “meals” for supper tonight at a popular restaurant called Saravana Bhavan. There are several, including one in New York, and the rickshaw driver took us to a take-away in the same chain by mistake so we had to take another to the restaurant. It was an irritating start but the staff were friendly and the food was good and plentiful. A “meal” is much like a “thali” with 15 small metal pots with different vegetarian concoctions inside served around the edge of a big metal dish. Rice, puris and popadums are served along with the limitless vegetable dishes. We finished with a sweet fudge-like cake, banana and pa’an. Joanne has tried chewing pa’an before (betel-nut with paste wrapped in a leaf) and had no intention of trying it again, Tim had seen rickshaw drivers and people on the street spit out the red juice and did not want to do likewise so we skipped the pa’an course! We dedicated today to stuffing the container. “Stuffing” is the technical term for putting Florence into the container where she is “lashed”, which means secured with wooden blocks by the wheels and strapping from the suspension to the container to prevent her moving. This cannot happen until the Customs officer checks that the paperwork tallies with the car and that he is happy for it to be exported. We arrived at the offices of Chakiat Shipping Agents at 10.30am expecting to travel to the container freight station (CFS) to meet with the Customs official shortly thereafter. We turned down an invitation for lunch at the Madras Club thinking that we could not guarantee we would finish in time but were confident that meeting there at 8.30pm would give us enough time to complete all the relevant formalities. Sadly, we had to cancel our evening appointment too and so missed our opportunity to meet with some Chennai people and visit the historic Madras institution. We could have finished just after lunch had the Customs official not delayed, then delayed and delayed a little more. Chakiat were very hospitable and let us use their conference room to work in – Tim tried to backup the laptop by burning a CD but, despite an attempt from the Chakiat computer man, the CD writer still does not work. Joanne wrote some letters in response to the post that had been sent to us from home care of Good Relations in Chennai. First we were offered coffee then lunchtime arrived with no hint of a move to the CFS so banana leaf parcels containing masala dosa were delivered to us plus plantains (green bananas) for desert. We even had time for tea before we finally received word that the Customs man was ready to leave his office in the Customs House next door for the CFS. We arrived at the CFS at six pm, after an hours drive through a particularly smelly fishing community and past the chemical works and oil refinery. The Customs official was by then into overtime and had an evenings work ahead of him. Perhaps we are cynical, but working after 5pm meant that he was paid extra by the agents; we do not know what exactly but we are told that it is expected that, as well as cash, he will expect to be taken to a restaurant (as he would have missed dinner) where he might order a bottle of whiskey or similar to compensate for having to work late. There was no option but to stuff the container tonight, otherwise it would miss the cut-off time for loading onto the ship meaning a two-week wait for the next one. Customs know the urgency and everyone involved understands the system for making it work. Most go along with it, as there seems to be no option. Corruption is accepted as commonplace at all levels in India. It has been proven that it stems from the top and most people we spoke to about it admitted that it should but would not change. At 7.15pm the Customs team inspected the chassis and engine numbers, checked cursorily inside the boot and asked if we had drugs in there, then left to complete some paperwork at the CFS offices. “Stuffing” the container and lashing the car by the light of a motorbike headlight took about an hour. As Samir drove us back in to town he played one of his large collection of Kenny Rogers CD’s, the country music playing in his comfortable air-con car was a world away from the one we passed back through – small huts of the poor fishing community, some lit, most not, people sitting between the houses, women picking lice from each others hair, naked children playing in the mud…we couldn’t smell the stench this time. Samir dropped us off at a restaurant that served quick Indian food such as idly, dosais and chapattis; at 10pm it was too late to order anything with rice so, on his advice, we ordered onion dosai and mineral water. The food was quick and good value, though the setting was basic - formica tables, no cutlery but small spoons, bright lights, ceiling fans and busy people eating, serving food or clearing tables. Joanne had eaten masala dosa for breakfast and lunch today, luckily onion dosai was a bit different – like a crisp pancake made with onion and served with coconut chutney and sambar. Followed by 3 idly between us and a very good sweet lassi we felt we had had a good supper for about £1 between us. The auto rickshaw back to the hotel cost more than the supper, despite our negotiations. 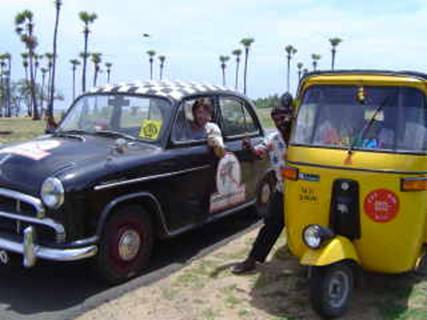 Only one of the auto rickshaws we have used in Chennai have working meters, unlike in Mumbai when, sometimes after a little insistence, all use meters. On some occasions we have checked and they genuinely do not work so beginning a journey by bartering with several rickshaw drivers is not only time-consuming and stressful but also unavoidable. Unfortunately, the replacement light lens has not arrived from the UK and we have had no luck with finding one here, despite the confidence of a couple of people we met here that they could find one for us. Joanne also wanted to find an image of Ganesh, the elephant god who clears obstacles, to fit to the front of the car but no-one has managed to find one of those, either. As were boarded the ship this afternoon it is too late for more searching in Chennai, we will have to have the replacement lens sent out to Singapore and Tim will continue his efforts to glue back the jigsaw pieces from the old smashed one in case the new one does not arrive. We took an auto-rickshaw to the studios of Chennai radio station, Radio Mirchi (meaning chilli pepper) on Mount Road. 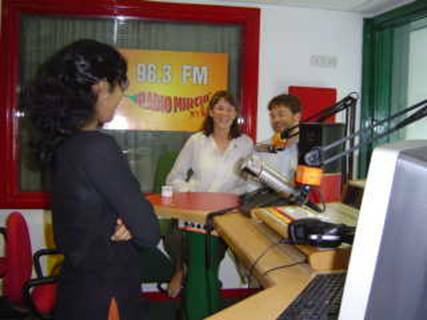 We have not given radio interviews in India so we were pleased to have been invited to the radio station, which is owned by the Times of India Group. After an informal and fun interview that will be edited and broadcast on several shows tomorrow we were shown around the stylish and well-equipped studios. A trailer for a Sunday programme was being put together in one studio and they were missing an English voice; Joanne made three attempts at saying “I’m lost” before the final version was recorded and her voice added to the trailer. The team at Radio Mirchi were not only professional but fun and friendly – we were even presented with beautiful bouquets of flowers and asked to pose for photos before we left. We had hoped to join Irene, an Austrian woman, and Rahul and Dolly for lunch at the Madras Club today to make up for missing dinner there last night but Rahul was out of town and we could not reach Irene by phone. We expected to have the afternoon and evening free before boarding the ship tomorrow morning but at midday, as we called in briefly to the British Deputy High Commission, we received a call asking us to get to the Chakiat Shipping Agents offices by 3pm today for boarding this afternoon – aaagh! A quick lunch at Dhaba Express at the El Dorado shopping centre around the corner from the DHC followed by the slowest auto rickshaw journey ever back to the hotel to collect our possessions and check out. The poor auto rickshaw driver had clearly chosen the wrong job as he was incredibly nervous and slow, we were even undertaken by a pushbike! More dramas on our departure from the hotel as our bill had not been prepared and a taxi had not been ordered as we had requested so we were delayed and Joanne became increasingly angry as the clock ticked closer and closer to our deadline of 3pm. Eventually, two taxis arrived and the hotel footed the bill for the one that took us back into town to the RCL/Chakiat Shipping Offices. We were well past our intended 3pm arrival so we were taken straight to the port to complete the Immigration and Customs procedures. The senior Immigration officer had given special dispensation for us to travel by container ship and, to our relief, once the final paper work was signed he came out from his office, shook our hands and wished us well. We boarded at 5pm, met the Captain and were shown our cabin. A little unsure of what we were supposed to do next, we waited for someone from the shipping agents to arrive as we had been told. At about 6pm we were collected and driven to the CCT offices where we were introduced to the marketing director of the Chennai Container Terminal, where the ship is docked. We posed for a photo then were driven back to the ship for drinks and small eats with the officers and members of the RCL/Chakiat Shipping team. Everyone left about 9pm; RCL/Chakiat had offered to take us ashore for dinner but we had eaten sufficient already so thanked them and declined their generous invitation. We were sorry that we had not been able to meet with Mike Eleson, Chairman of the British Business Group, who had seen us in the paper today and called to invite us to attend a meeting of the photography club tonight but, as the ship is scheduled to depart tomorrow morning it is important that we are on board tonight.